Black Friday, a term coined in the 1960s refers to the Friday that follows Thanksgiving day. It also marks the start of the bustling Christmas Shopping season. It’s that time of the year when people line up at retail stores to buy and of course, look for lucrative deals all across the web. Although many of the great deals to be found during Black Friday may not be available over the web. Ever wondered why they call it “Black” Friday ? Black relates to the fact that business profits were recorded in black and losses in red. Of course back then, this sort of financial record keeping was done by hand. But it also has certain roots in periods of financial crisis in the past. But more recently it has become a popular way to sell consumer goods and other products at highly discounted prices. 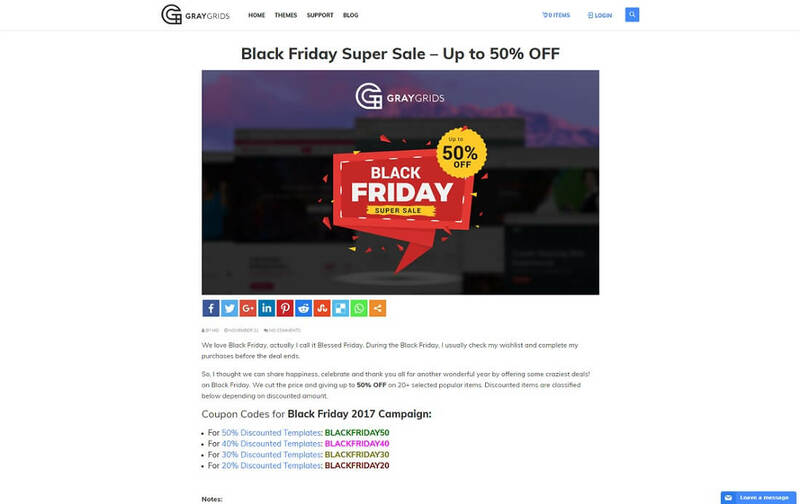 There is an entire spectrum of retailers offering great deals through coupons, email marketing and any other viable channels of communication starting a month or two prior to Black Friday. 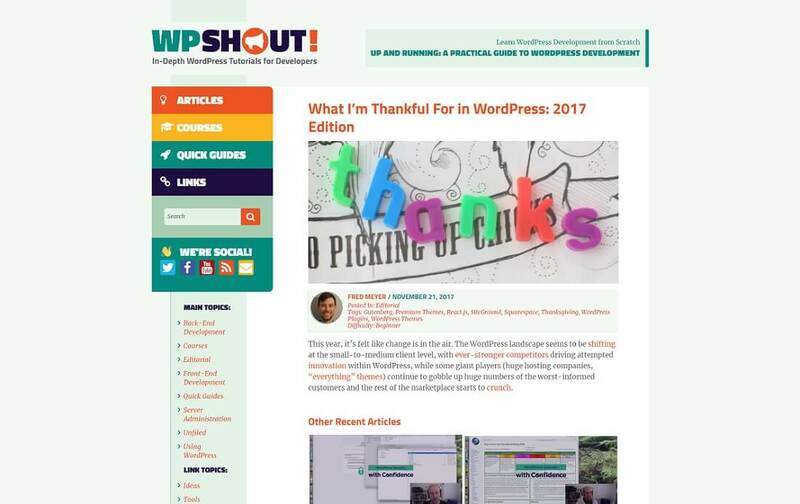 A few retailers hold off on making Black Friday WordPress deals until the very last hour, so as to stoke the public’s imagination and generate more interest. You name it, home theaters, laptops, smart phones and more all available. And increasingly, more people are staying indoors and accessing these deals through online retailers. 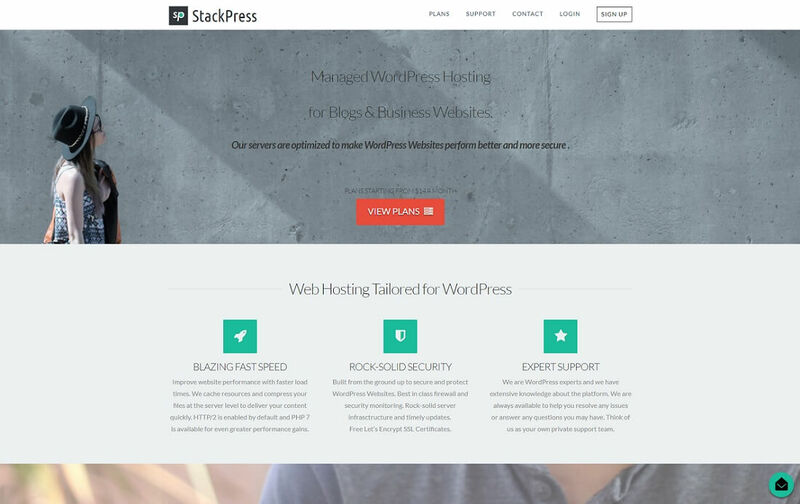 There are a great number of deals including ones that offer web hosting services at incredibly cheap rates, WordPress themes being sold at a fraction of the original price, awesome WordPress plugins including email marketing services, advertisement management plugins, popup plugins, sliders and pretty much anything else that can be bought in the WP market, all of which will be sold for a lot less than you might expect during this brief window of festivity. 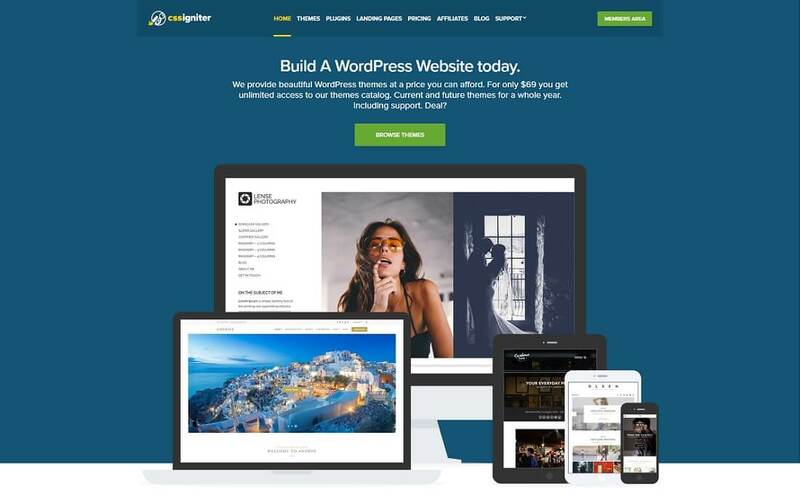 We invite all WordPress & Web Hosting businesses to send us their best Black Friday 2017 WordPress offers and deals to Colorlib. And of course, we invite our readers to keep their eyes pealed for the best deals and we’ll make sure you get the best! You can submit your deal by clicking here on the great button located below. 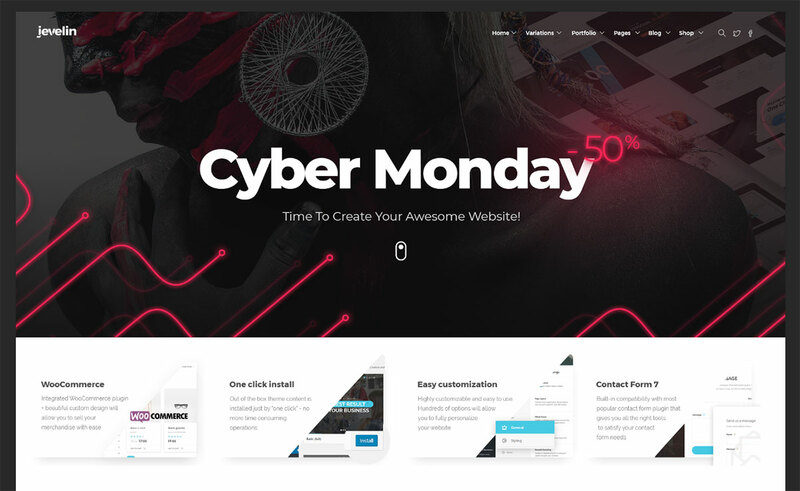 Get 50% off Jevelin theme as part of Envato Market annual Black Friday and Cyber Monday sale. 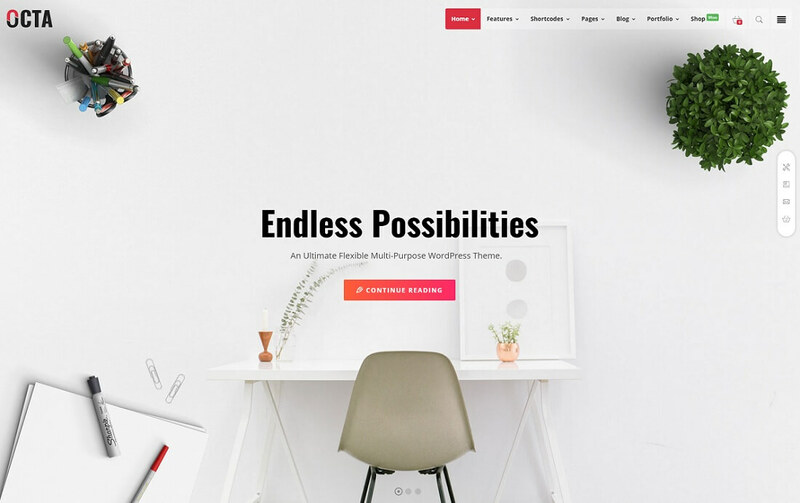 This is the most popular multipurpose theme available today with loads of awesome features and demo examples. 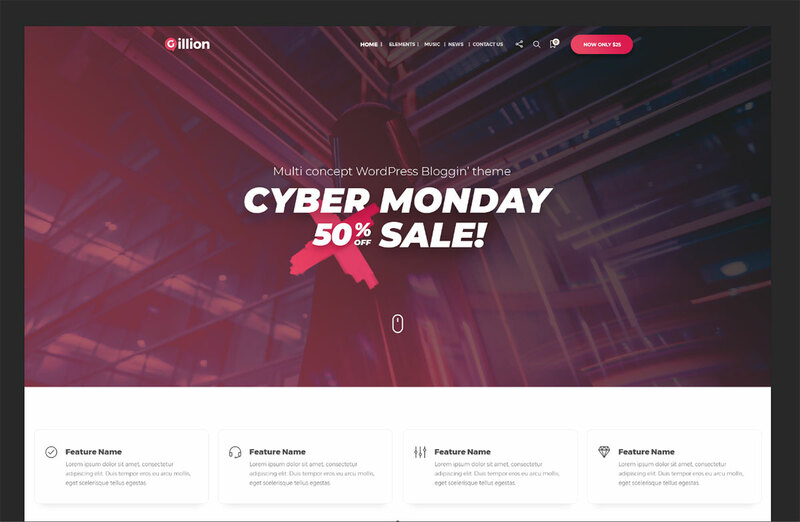 Get 50% off Gillion theme as part of Envato Market annual Black Friday and Cyber Monday sale. 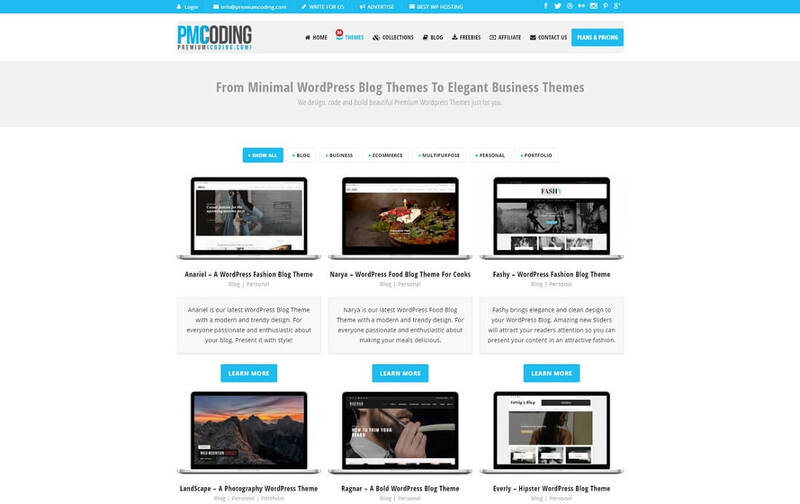 This is the most popular and flexible WordPress blog theme out there. 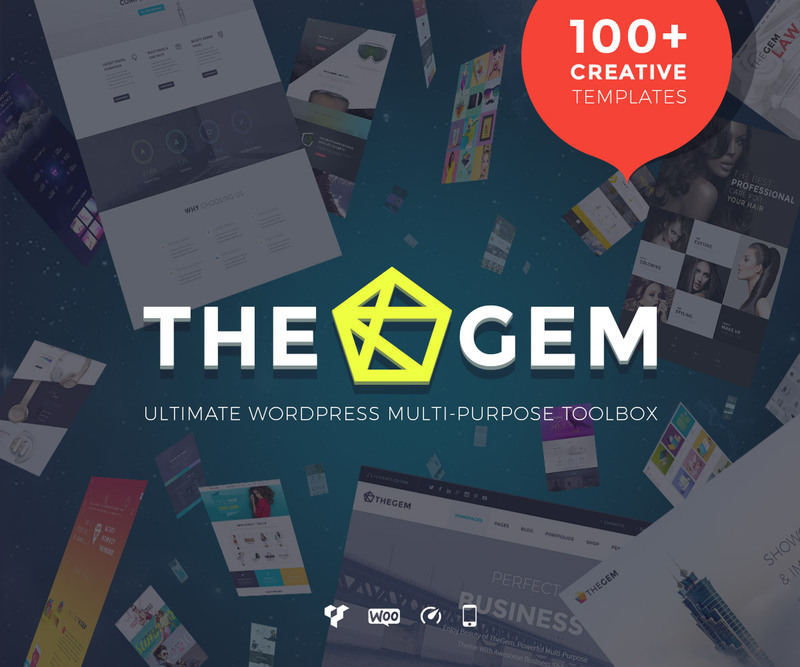 Get 50% off 500 digital assets, templates and files. 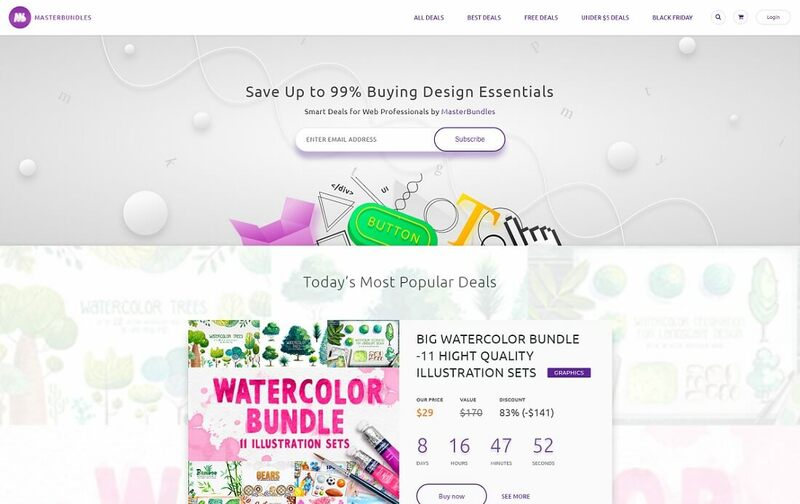 This is the largest sales in the history of Envato Market and make sure to use this opportunity. Limited Offer! 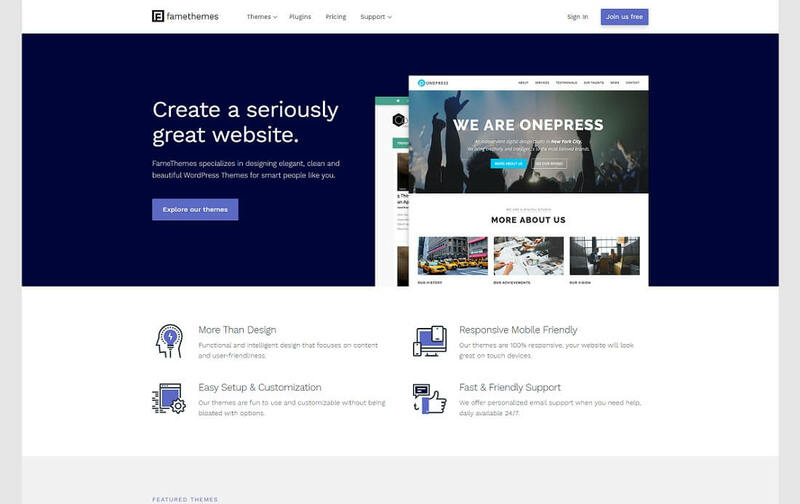 Get one of the best creative multi-purpose WordPress themes on themeforest.net for 50% less! Elegant Themes this year has many great options to save big on all their products as well as get their T-shirt as well as other goodies. This is one of the best Black Friday sales this year. 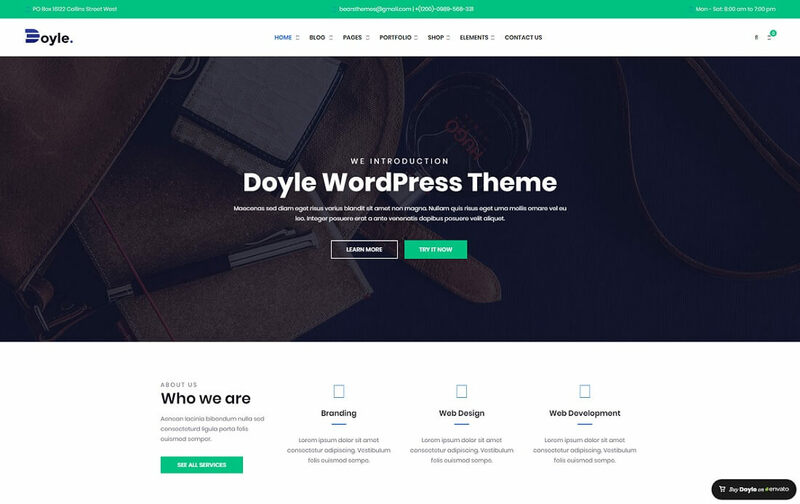 Buy now OCTA WordPress theme for only $29 instead of $59 and build your site with this ultimate theme. 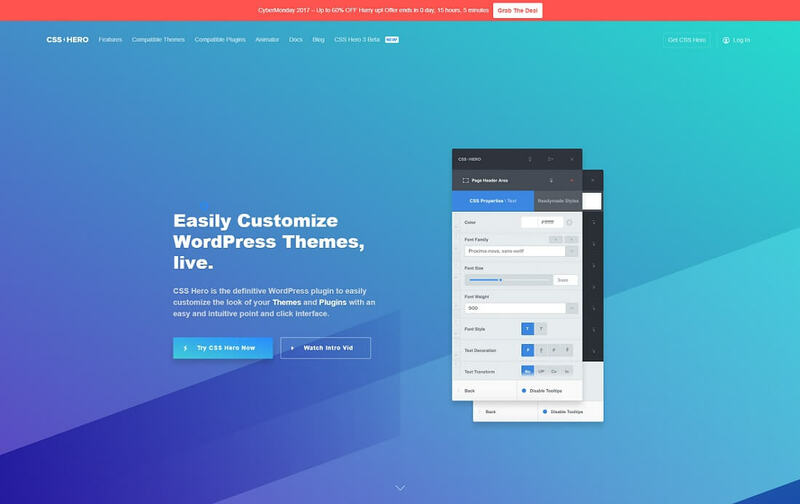 StrictThemes drops the price to 50% on all their themes. 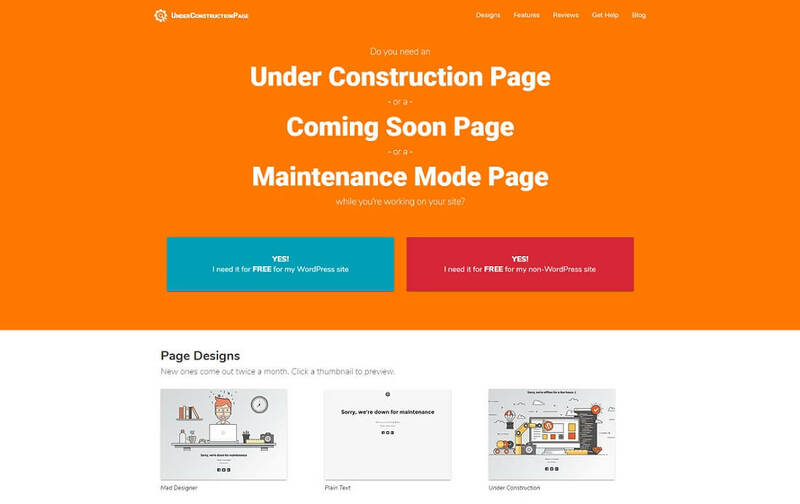 You can check the themes by clicking on the link below. Act quickly before it is too late. 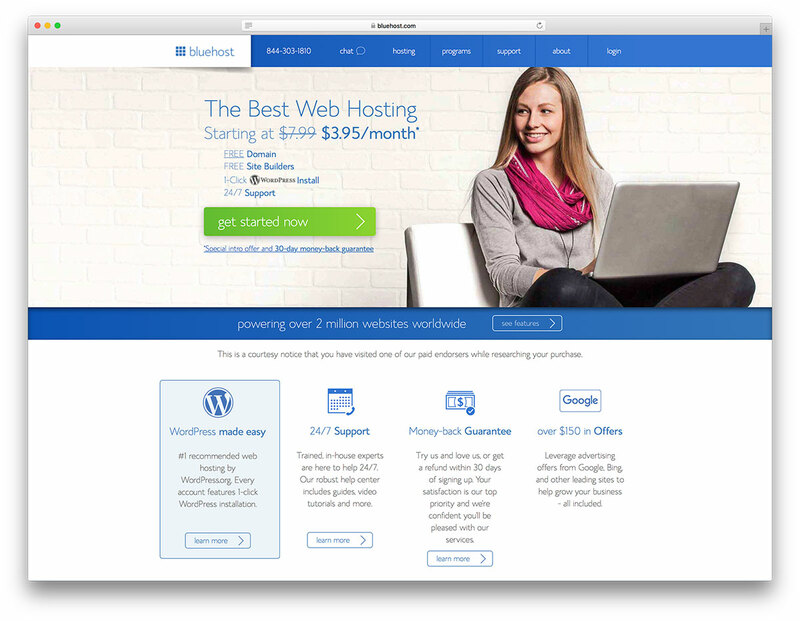 Get 70% OFF any hosting option. This option runs from Black Friday until Cyber Monday. 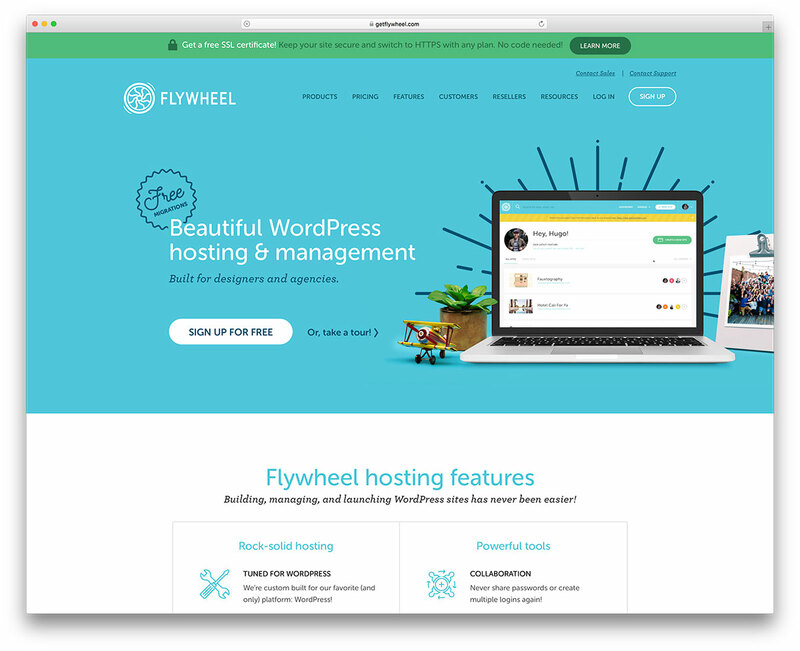 Get 70% OFF any hosting option with out exclusive link you can find bellow. 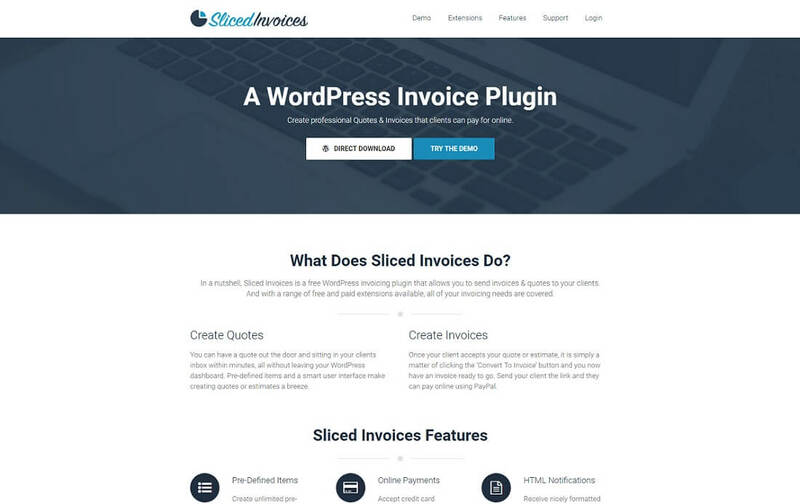 Save 35% off your first payment with WP Engine! Validity: November 22 – November 30, 2017. 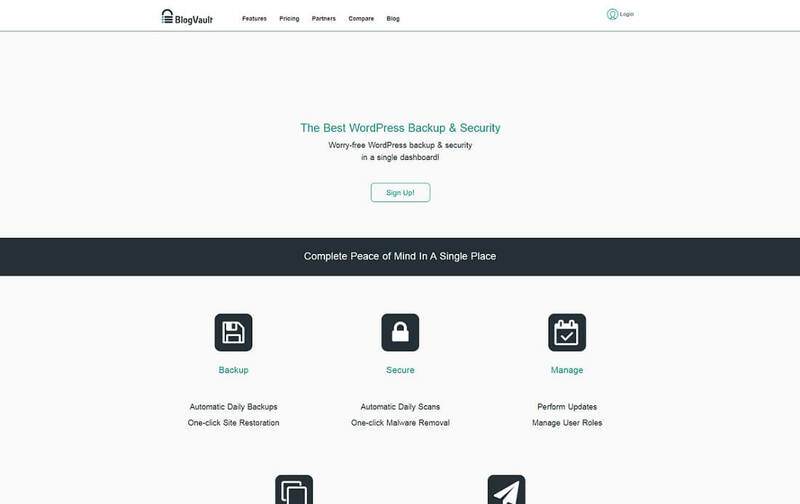 Get 3 months free on all annual WordPress hosting plans during Black Friday (starting at just $11.25/month)! 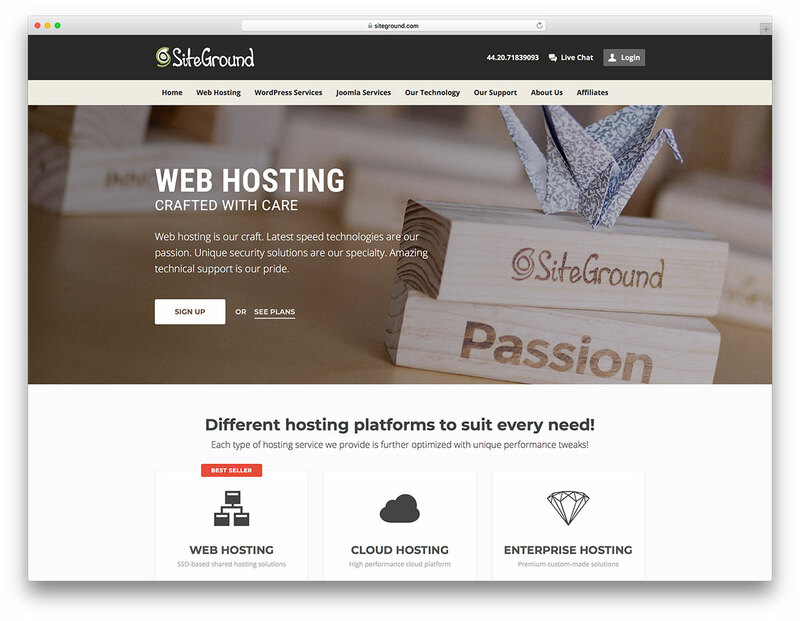 Plans include free SSL certificates, free migrations, and more. Offer is valid from 12:01 a.m. on Monday, Nov. 20th to 11:59 p.m. on Tuesday, Nov. 28. 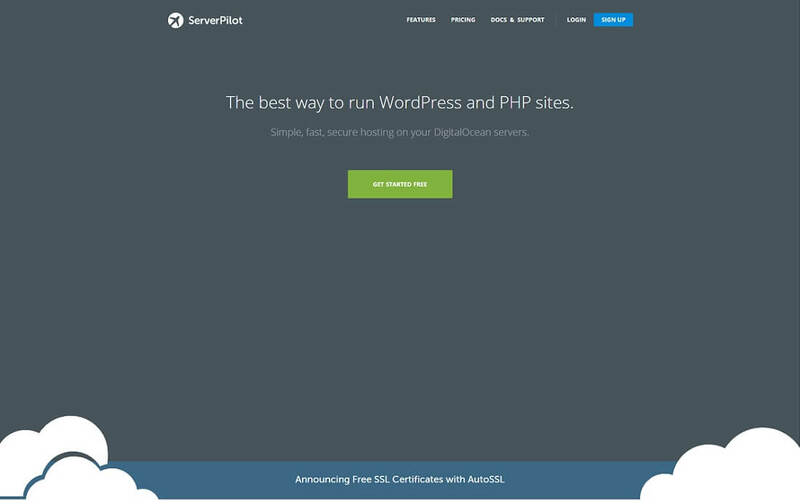 ServerPilot is offering a 3-month free trial of their cloud hosting control panel ($30+ value). Discount is applied on signup. 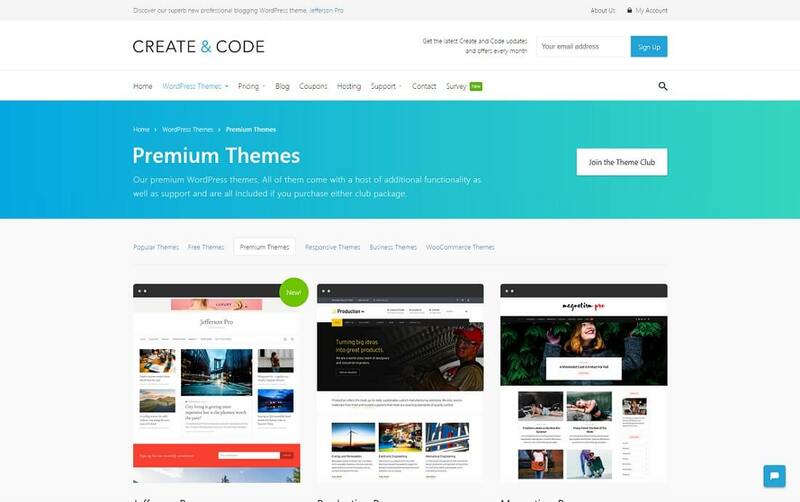 Get 50% off all of Create and Code’s individual themes or save even more by picking up their club package for half the price! Just use the code BLACKFRIDAY2018 at checkout. 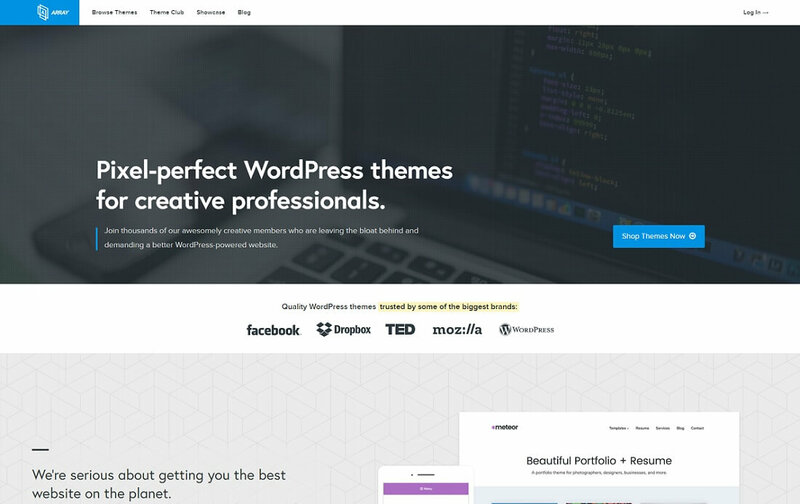 Buy the Theme Bundle at 50% off. 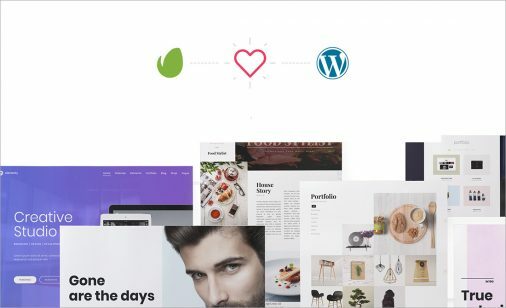 That is 14 Premium WordPress Themes for less than $30! Just use the code BLACKTE at checkout. 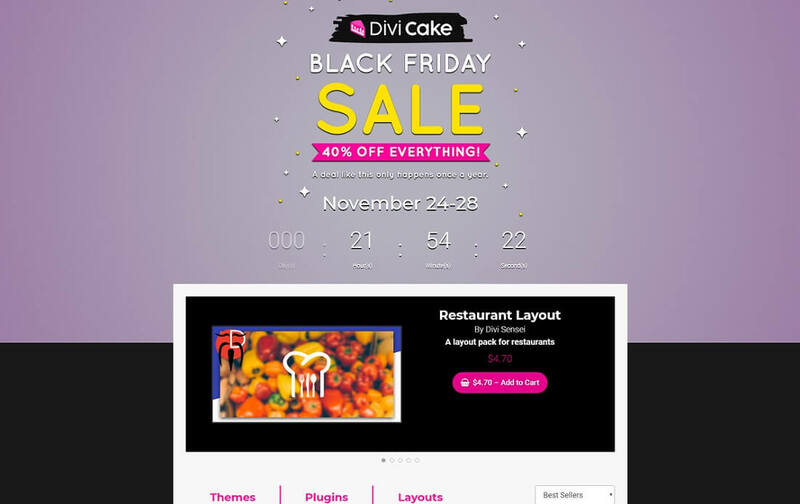 Divi Cake, a leading Divi Marketplace, is offering 40% off every Divi child theme, plugin, and layout. This type of sale only happens once a year, so don’t miss it! Get 60% off all PremiumCoding products. 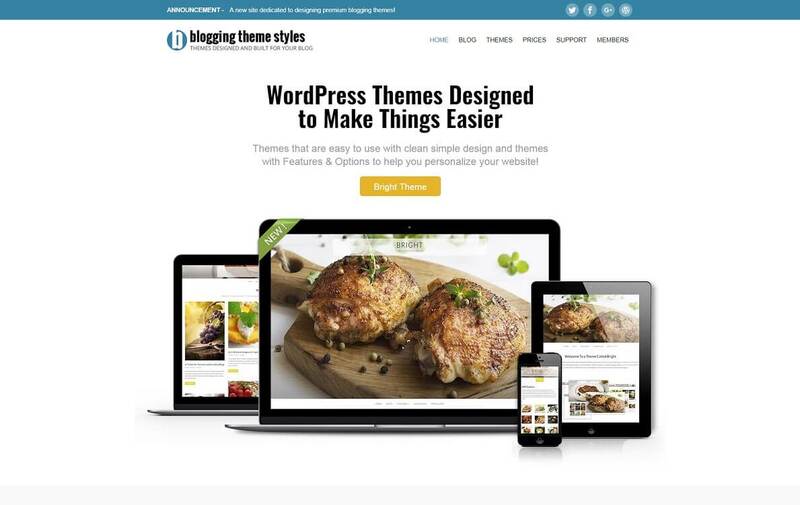 It is their biggest sale of the year as they are offering a discount on all their WordPress themes and subscriptions. Use code PremiumCodingCyber60 at checkout. 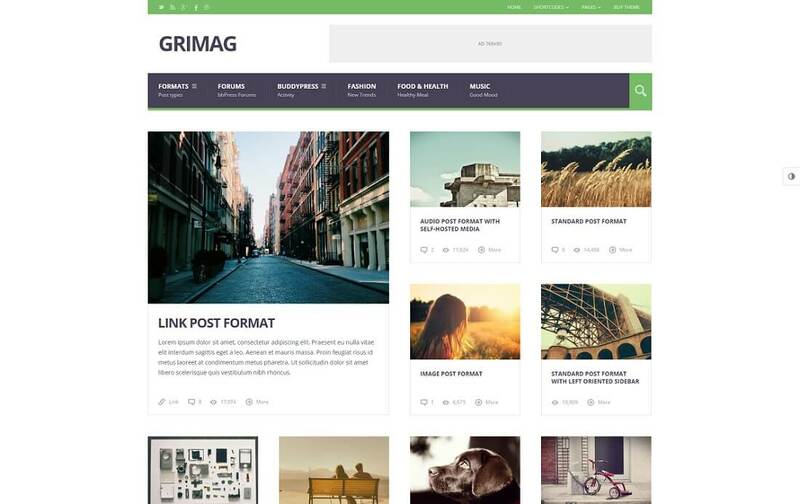 GrayGrids cuts the price and gives up to 50% OFF on 20+ selected WordPress themes and HTML templates. 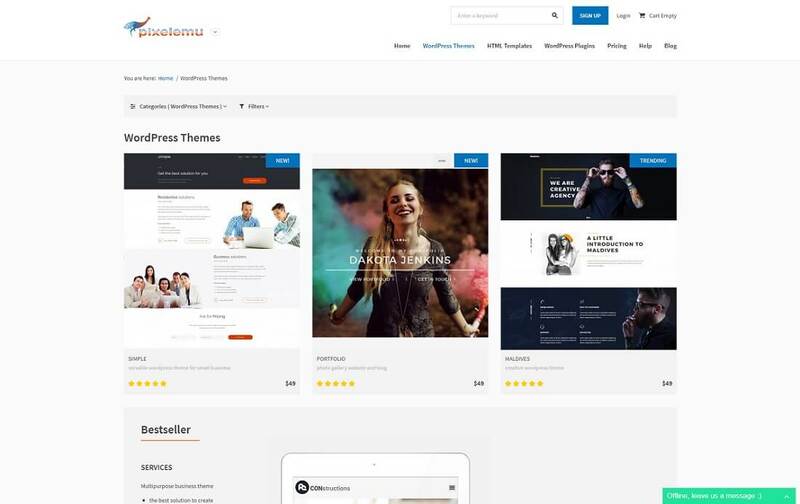 MotoPress offers 55% discount on all professional top-rated WordPress themes, user-friendly plugins and Membership plan! Use MPBESTBUY discount code during checkout. 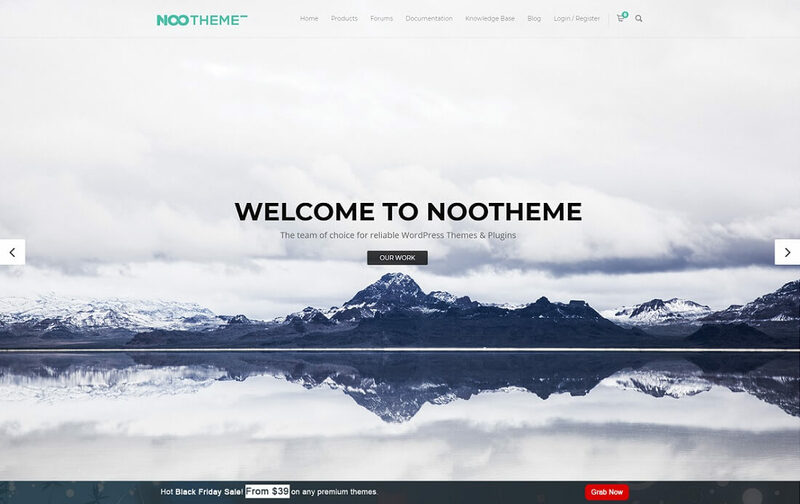 On Black Friday and Cyber Monday, NooTheme offers you every WordPress theme for only $39. Limited Offer! 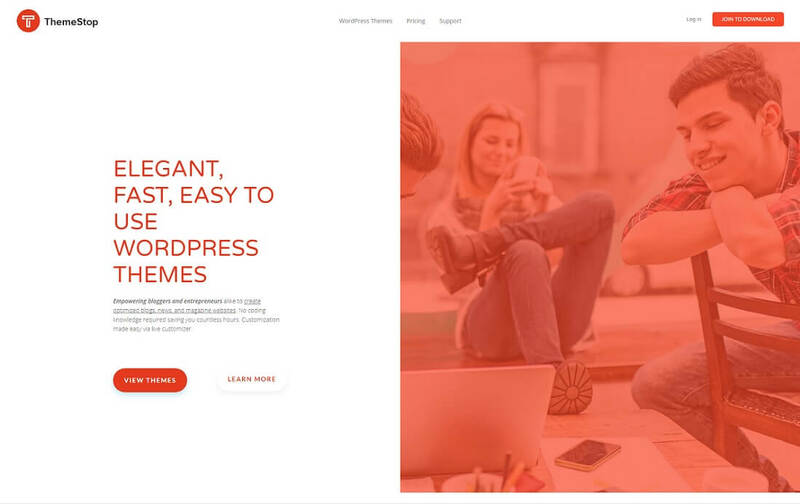 Get the best learning curve multi-purpose WordPress theme on themeforest.net for 50% less! 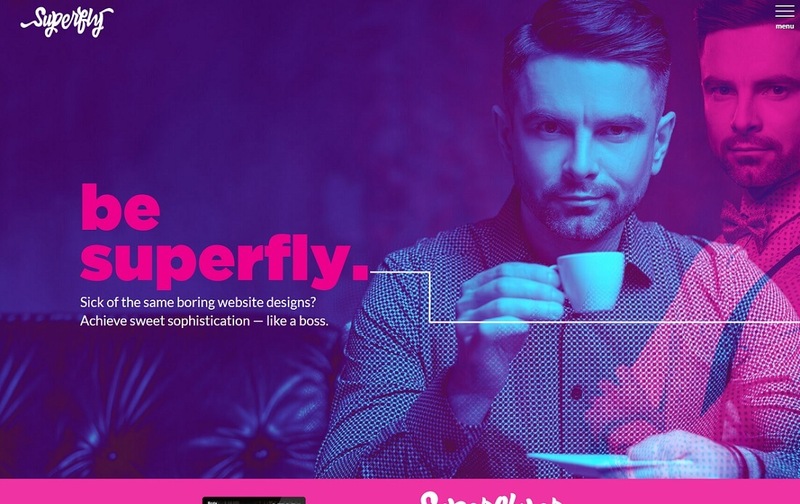 15% of your entire purchase in Superfly’s shop with the coupon code: blackfriday15. 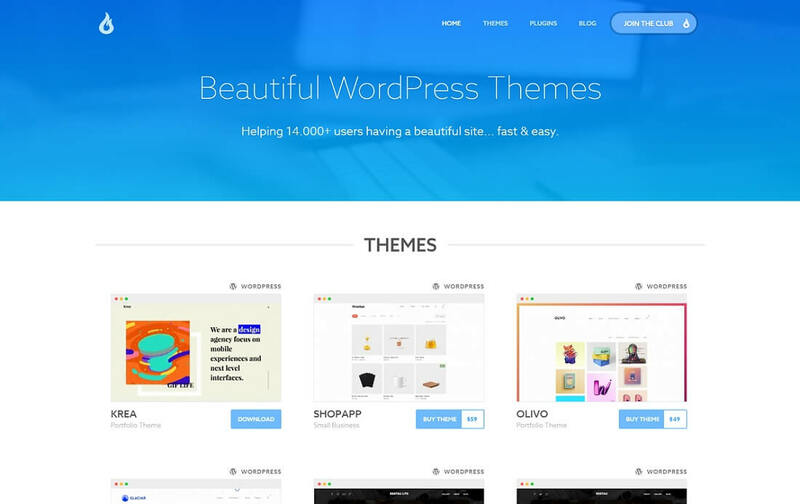 Get 40% off on the best designed WordPress themes collection on the planet! 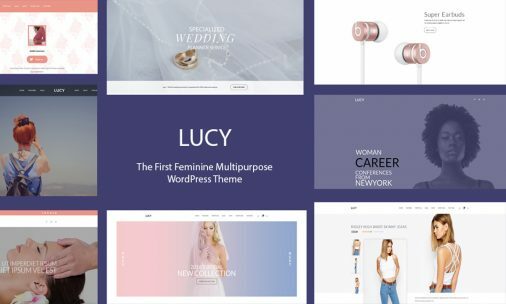 From November 24th – 30th, Array Themes is offering 40% off the entire collection of eCommerce, magazine, blog and photography themes. This is their last sale of the year so grab it while you can! 50% discount on Black Friday and Cyber Monday. 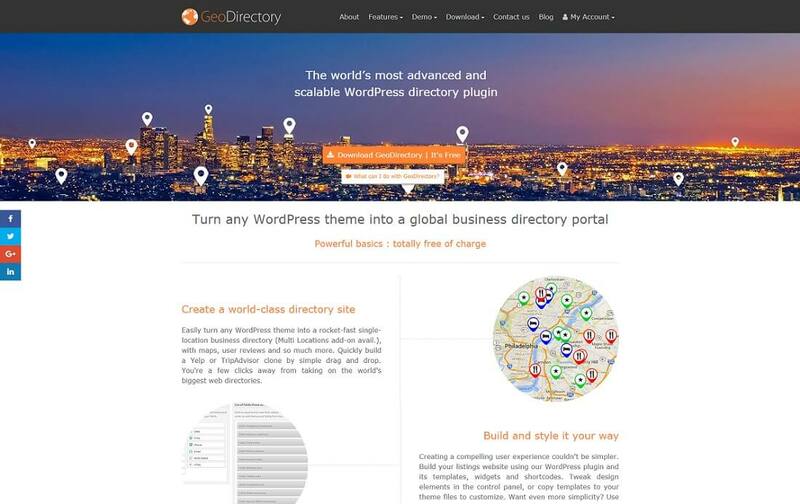 130 Wonderful WordPress Themes for just $99. 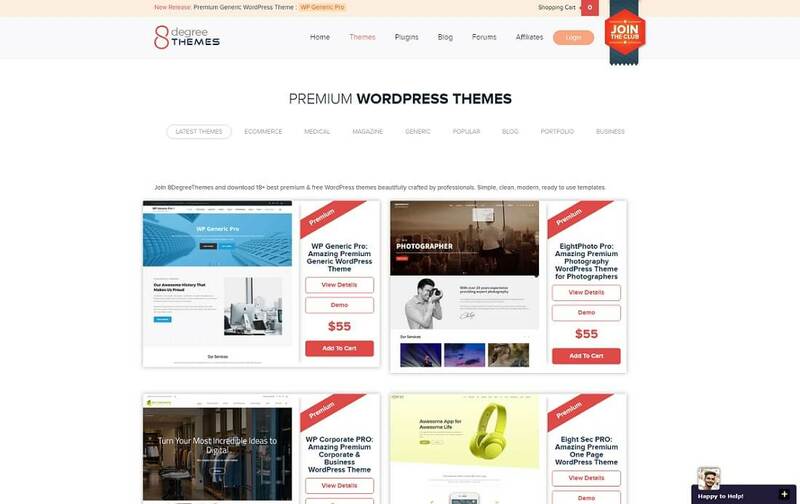 7Theme offers 50% off most of their premium WordPress themes. 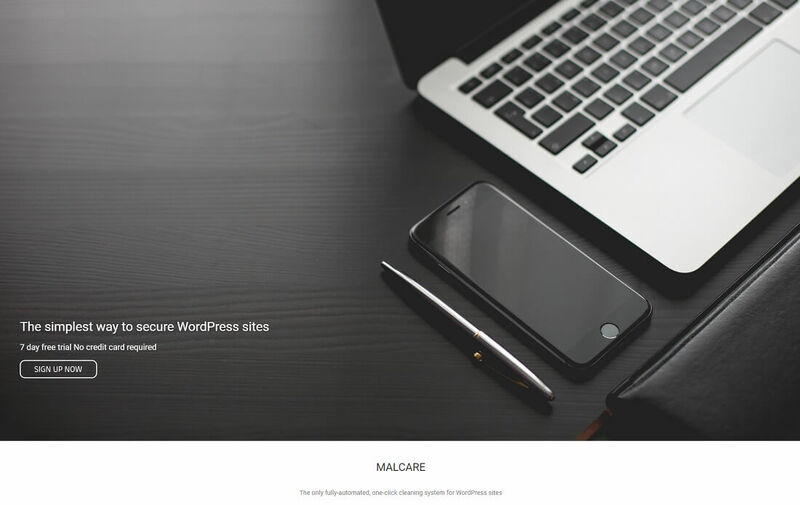 Kallyas, one of the top selling WordPress Themes of 2017, is celebrating Black Friday at a 50% discount. The Most Wanted Day of the Year is Here! Treat Yourself with 50% Discount for Any Template this Black Friday and Cyber Monday! Get 50% off any purchase, including the Premium Membership. Don’t wait or the deal will be no more. Limited Time Offer! 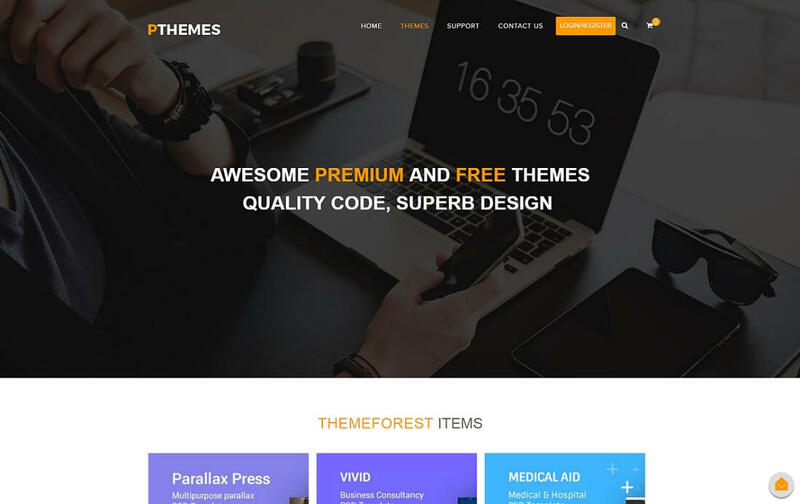 Get one of the best creative multi-purpose H-Code WordPress theme on themeforest.net for 50% less! 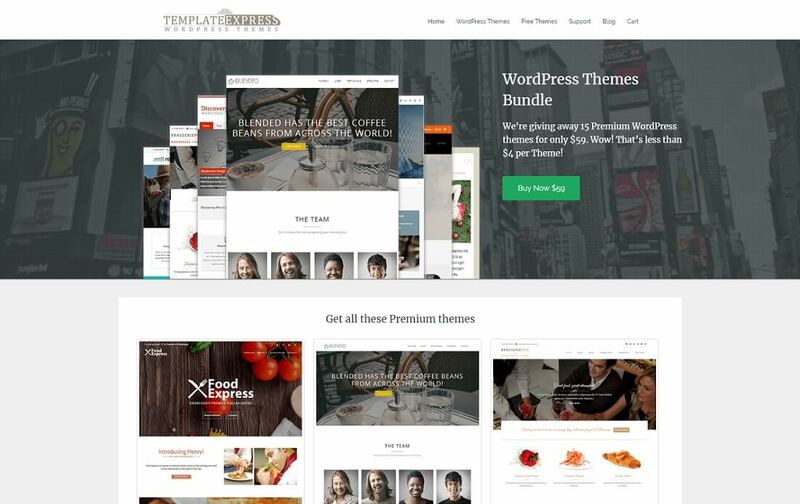 50% off all theme purchases. 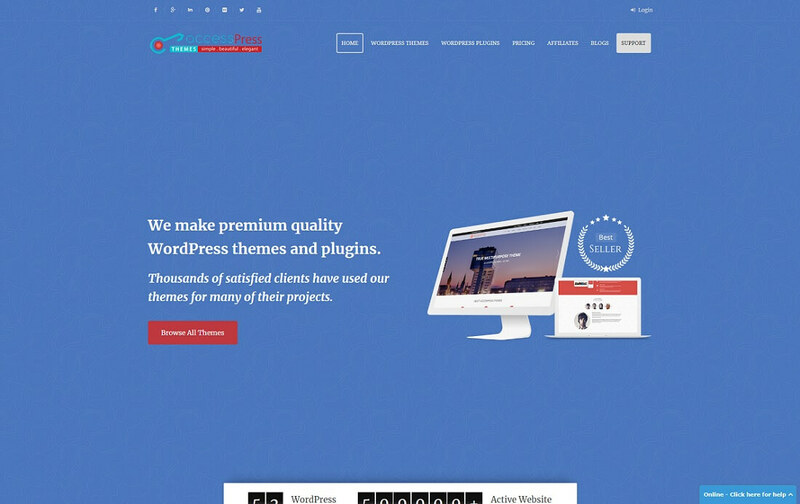 Astra is the fastest WordPress theme that is available for free in the WordPress repository. 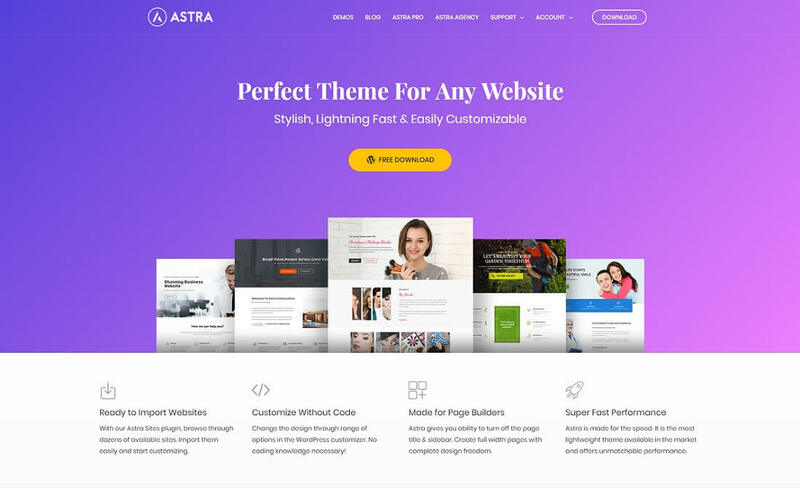 Astra Pro add-on is a plugin that enhances the possibilities of the Astra Theme giving you more options to beautify your website. 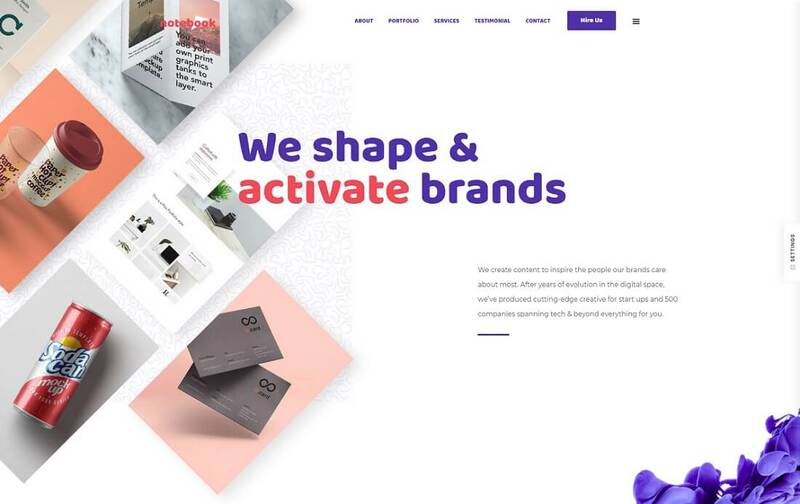 The Astra Agency package is a complete package that comprises of essential tools for your website. 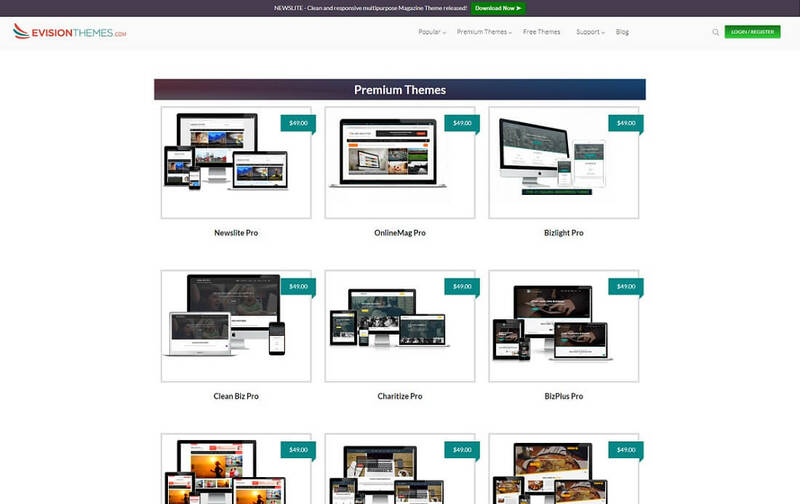 The package currently contains the Astra Pro addons, Astra premium website demos, the Ultimate Addons for Beaver Builder and Convert Pro. You can purchase the Astra Pro addon or Astra Agency at 30% OFF by using the coupon code BLACKFRIDAY at the time of checkout. 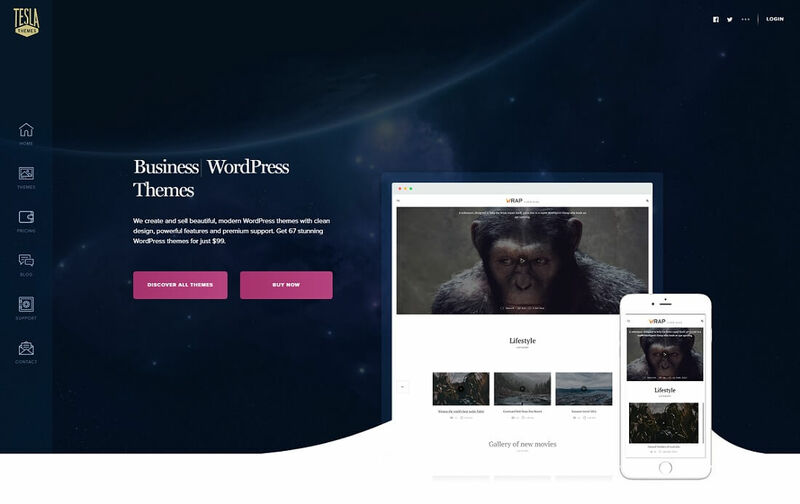 Get the incredible ionMag News WordPress Theme and build professional blog, news or magazine websites. 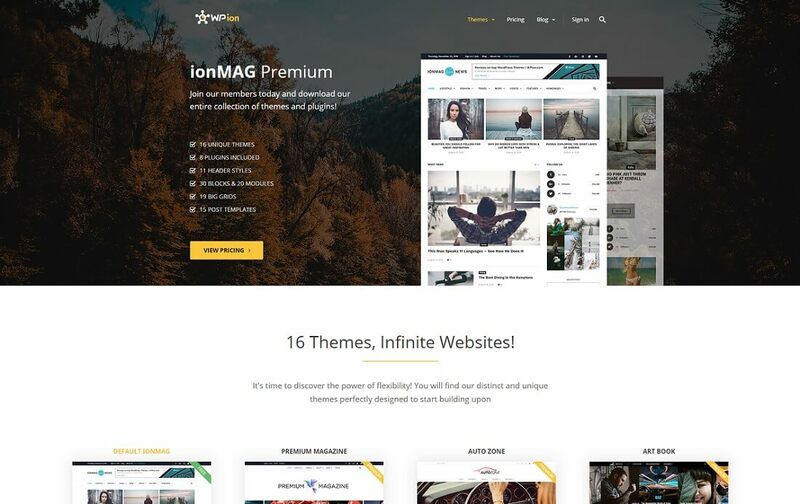 Use the Black50 coupon code at checkout and get 50% OFF on the ionMag premium news WordPress theme! 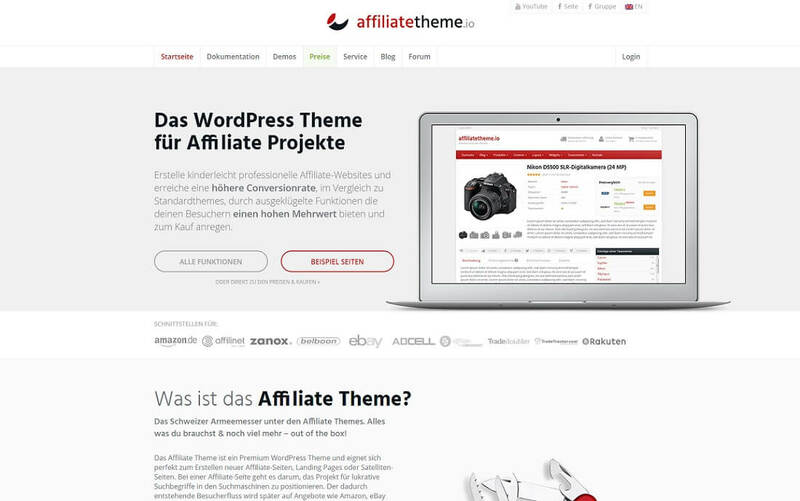 The package includes +40 premium themes with extended license, unlimited domain use & support, now for $45 only! 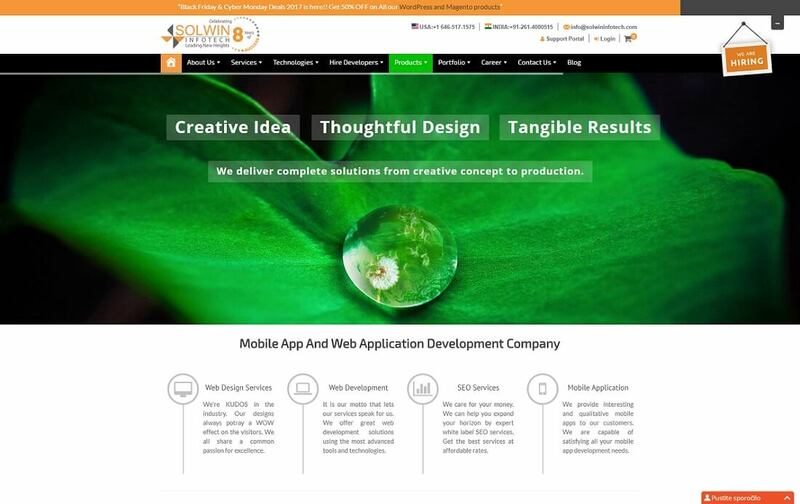 All themes are responsive, modern, clean coded, cross-browser compatible and constantly updated. 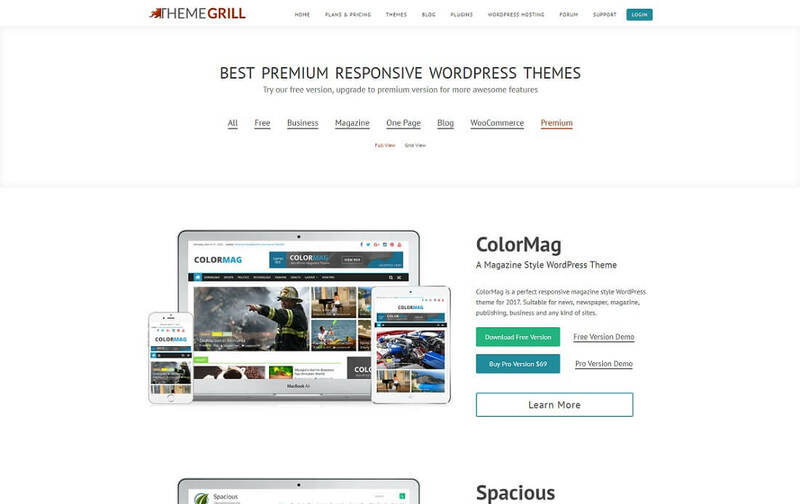 ThemeGrill offers 33% off on all their premium products. Coupon Code: BFCM33. 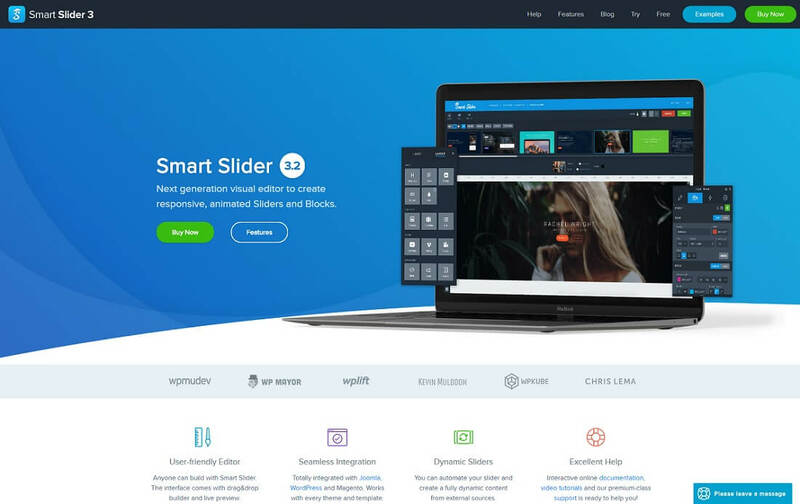 During the week (November 20-27), MotoCMS is giving an ultimate discount up to 50% off all premium, HTML, website builder and eCommerce templates. Get 50% off on the purchase of any single theme or any of the membership plans using the code “BFCM50”. Join 250,000 happy users now. 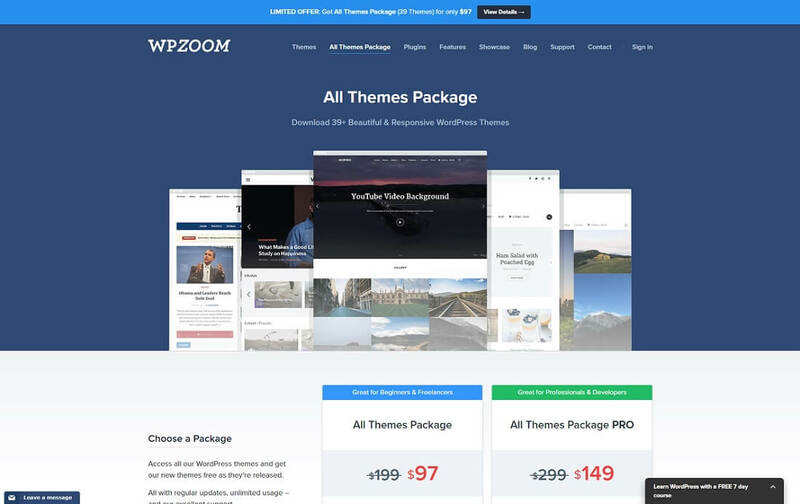 If you’re looking for the best themes to build a professional website, eVision Themes is giving 20% discount on all WordPress themes. Hurry up and grab the deal today! 40% off Photocrati Pro w/ NextGEN Pro using the coupon code, BF40. 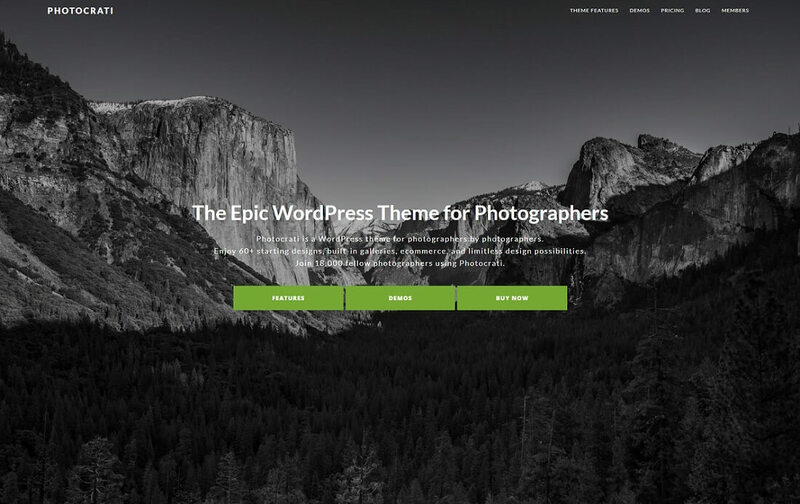 Get one of the most popular WordPress themes for photographers, with enhanced control over the design and dozens of built-in designs. Sell images as prints and digital downloads, proof images and display them beautifully using NextGEN Pro. Get 25% OFF until November 30th, 2017. Use coupon code BF2017 at checkout. Quema Labs offers you a 40% off discount on Black Friday and Cyber Monday. 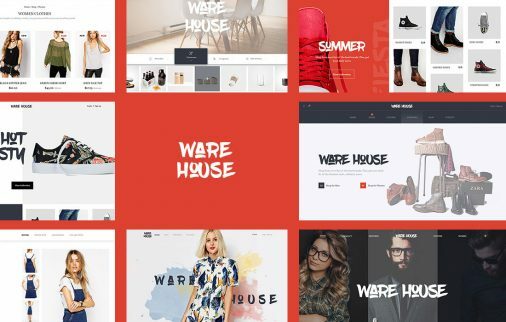 So, if you want to create an amazing e-commerce site, personal portfolio, restaurant site, corporate website or anything in between, this is your chance to do it at a really low price with a high-quality WordPress theme! Use coupon BLACKFRIDAY40 right now! 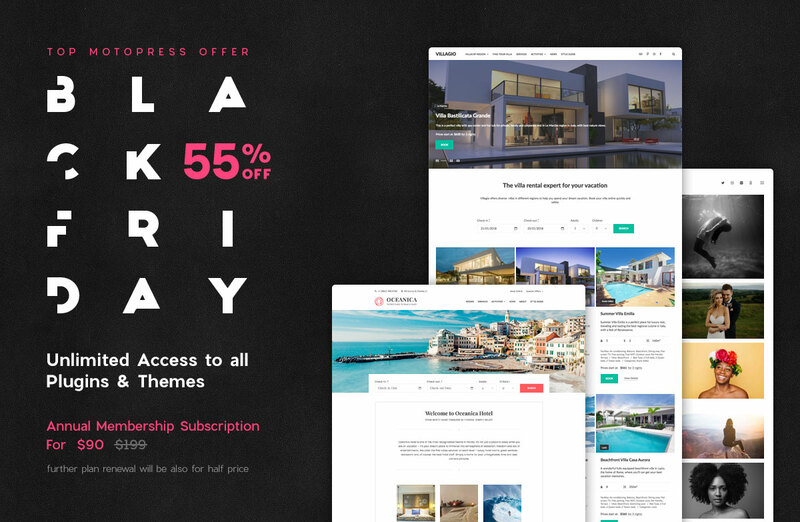 This Black Friday & Cyber Monday, AccessPress Themes offers 40% Off on all their premium WordPress themes. To get the deal, use coupon code “BFCM2017” while checking out. Grab the bargain soon! 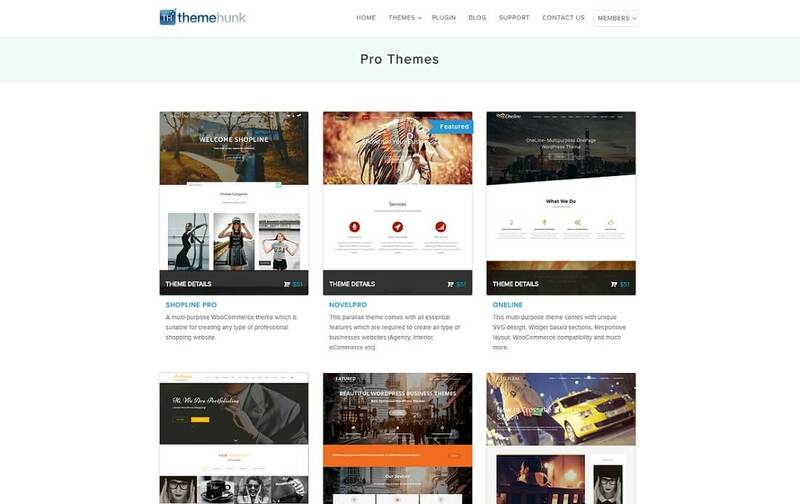 ThemeHunk Deal: 40% OFF on any WordPress theme. 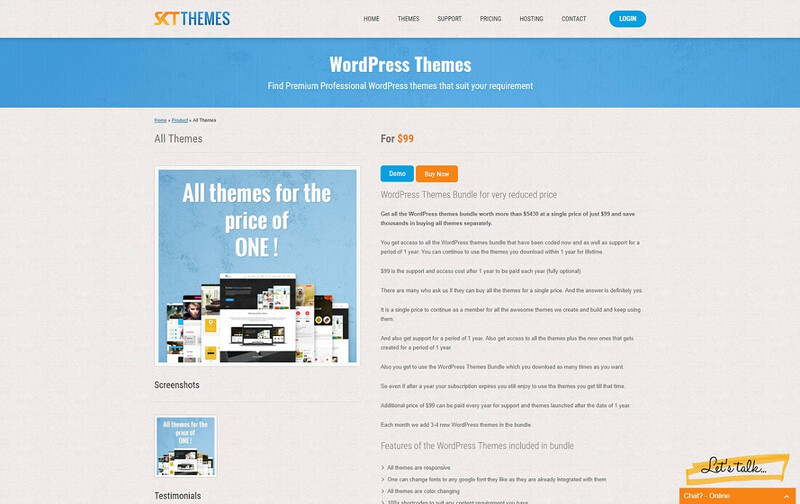 40% off all ShowThemes using the coupon code, BF40. 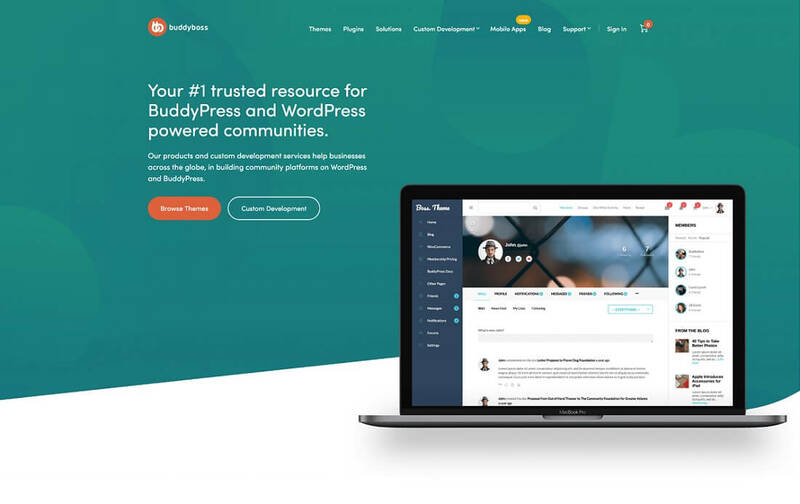 Pick up a bundle of handcrafted WordPress themes for events and conferences. 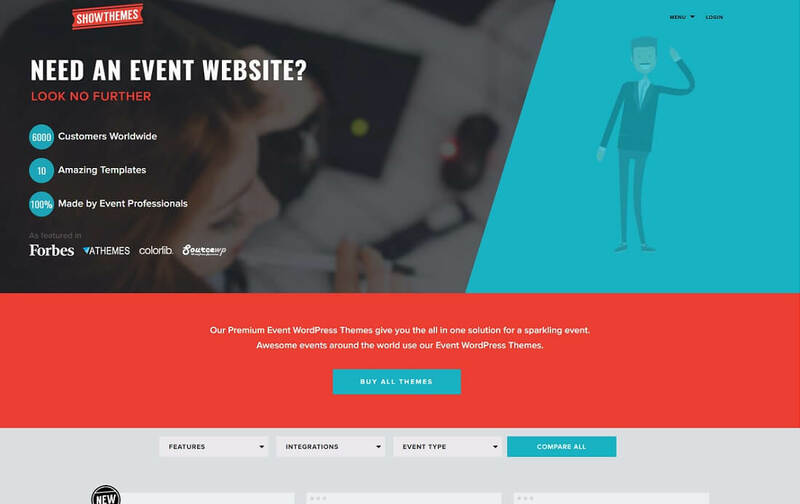 Get everything you need to create a website for your next event. Make it shine and attract attendees. 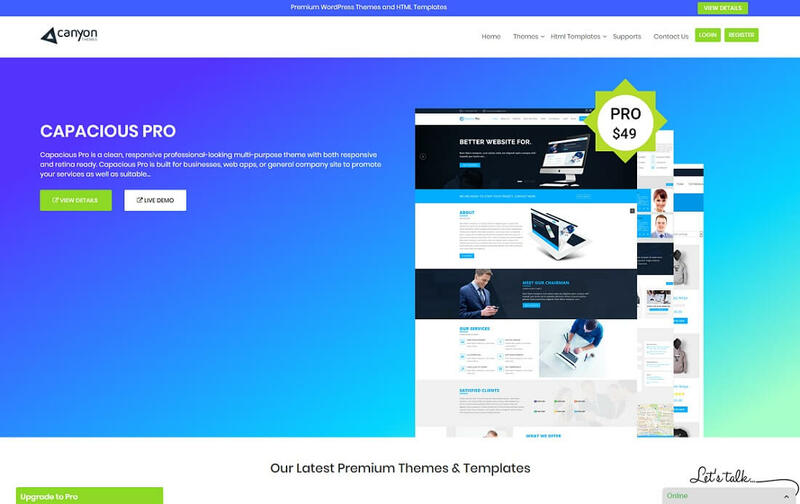 Theme-Stop Offers 60% Off All 25+ Premium themes. 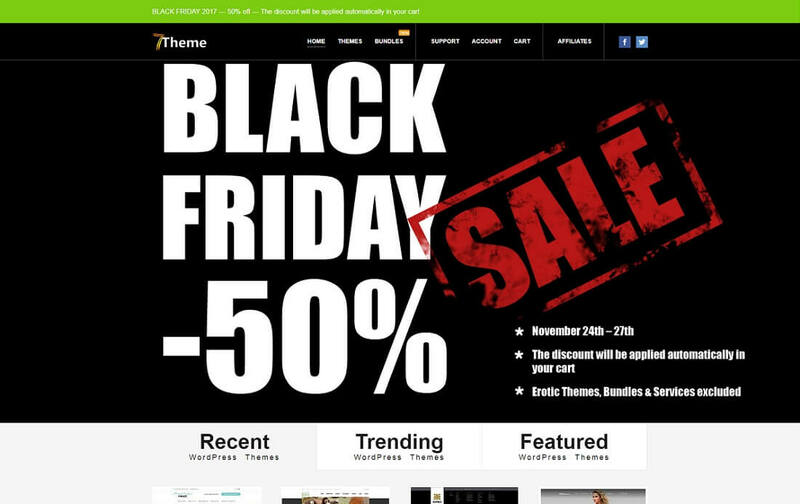 On this occasion of Black Friday, 8DegreeThemes offers 50% off on all their premium themes. Grab it soon! 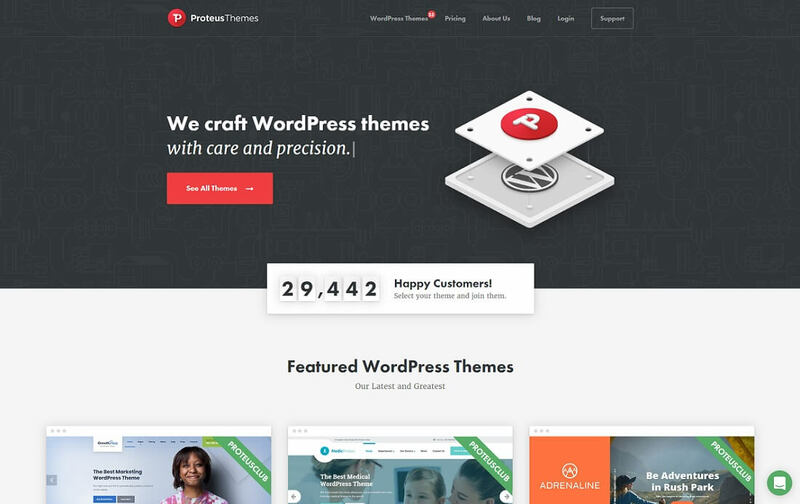 Get 90% discount on ProteusClub monthly which includes 10+ niche-specific WordPress themes with unlimited active sites. 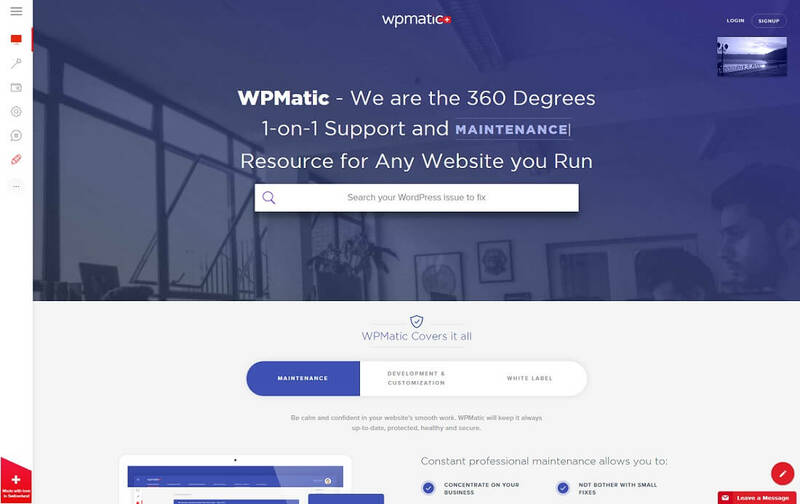 30% discount on HTML and WordPress templates. Coupon Code: blackfriday. 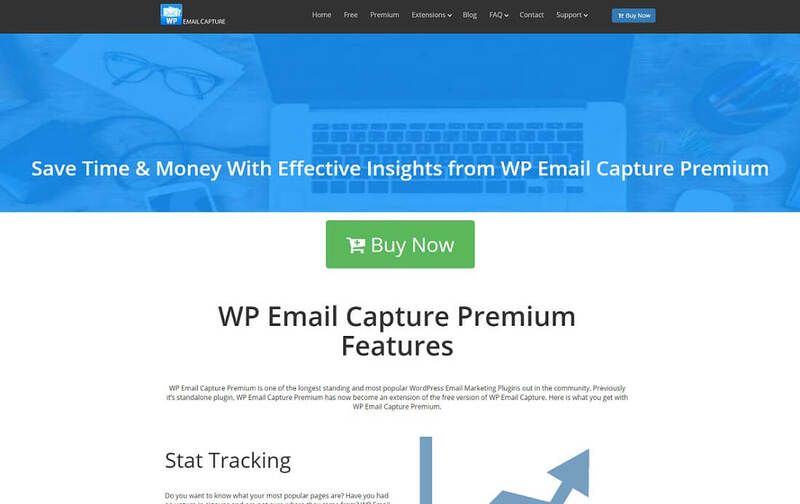 Get 40% off on all yearly plans and lifetime plan of WP Coupons and Deals plugin. 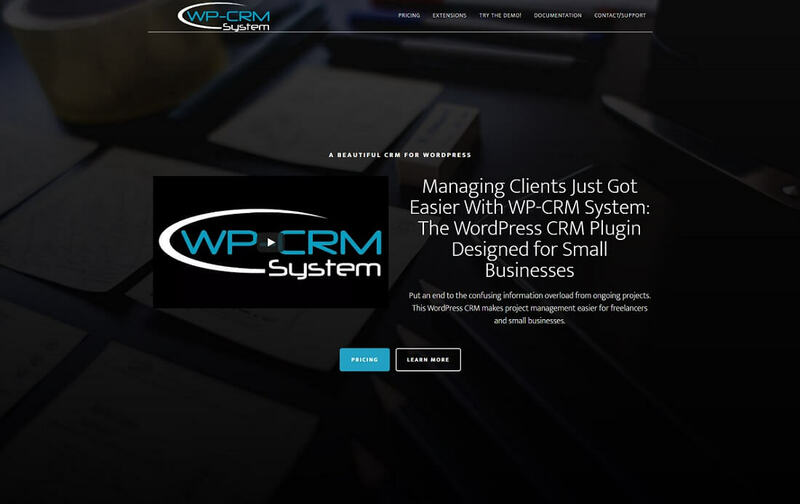 Use the coupon code WPCD40. 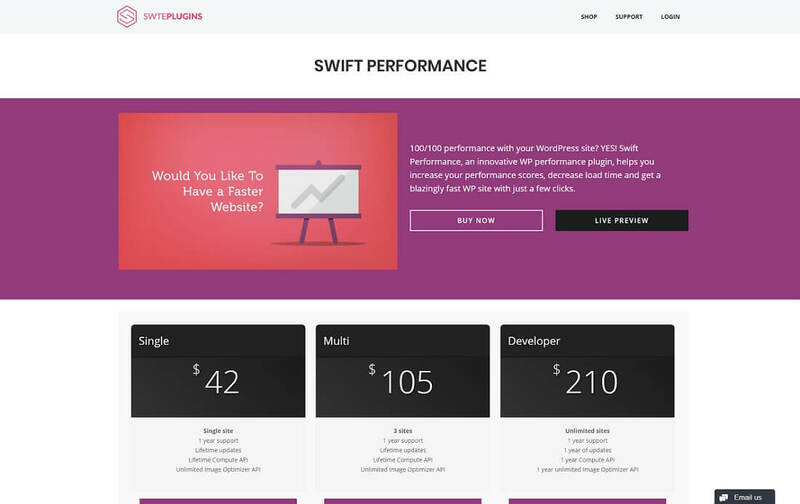 Buy Swift Performance at 50% OFF. Just use the coupon code COLORLIB during checkout. 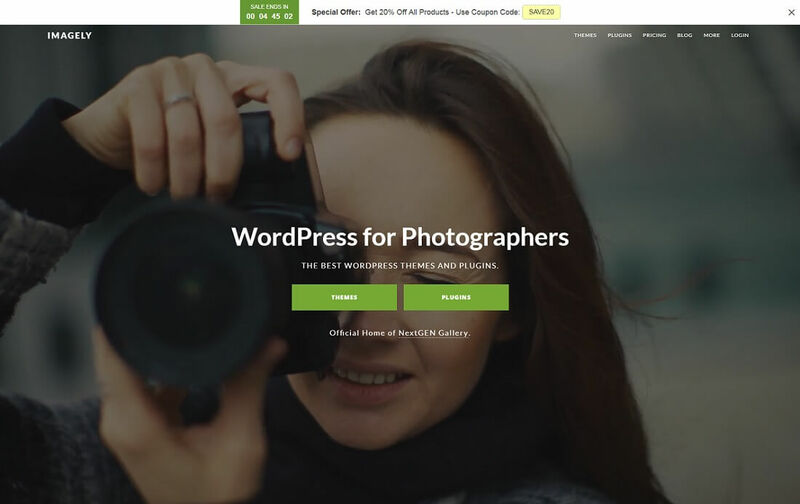 ProfilePress is giving away 25 percent off your entire purchase from Black Friday through Cyber Monday. Don’t miss it! MailOptin is giving away 25 percent off your entire purchase from Black Friday through Cyber Monday. Just use the coupon code BFCM2017. 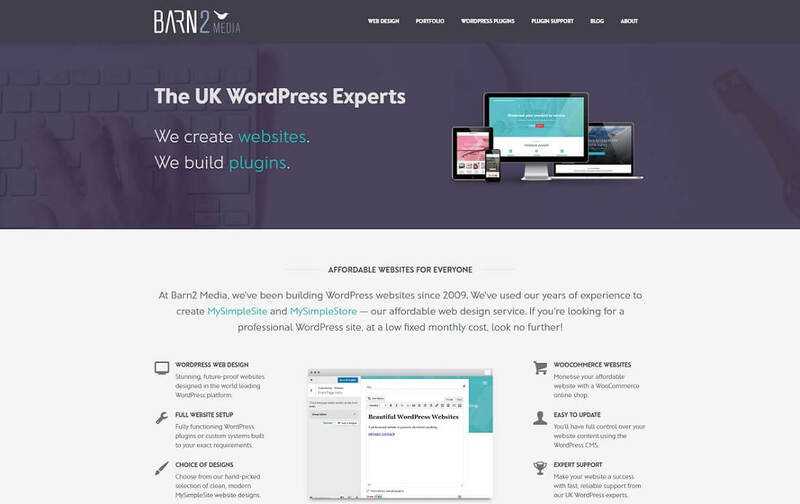 Barn2 offers 50% off of all their WordPress plugins using coupon code BARN2CYBER2017. 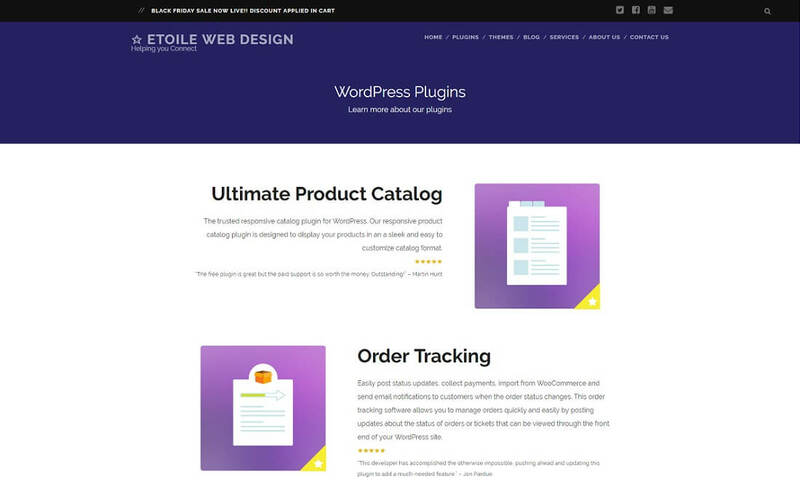 It gives 50% discount on all their premium plugins, including the bestselling WooCommerce Product Table plugin. 30% Off all Magic Toolbox plugins. 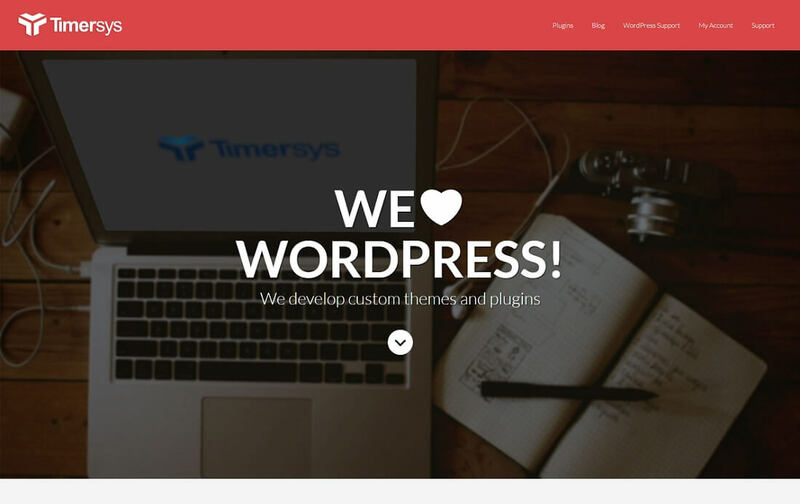 Get 20% off on all products (Themes & Plugins) across WisdmLabs site. The coupon code is BLACKFRIDAY2017 and it is valid from 21st November 2017 to 28th November 2017. 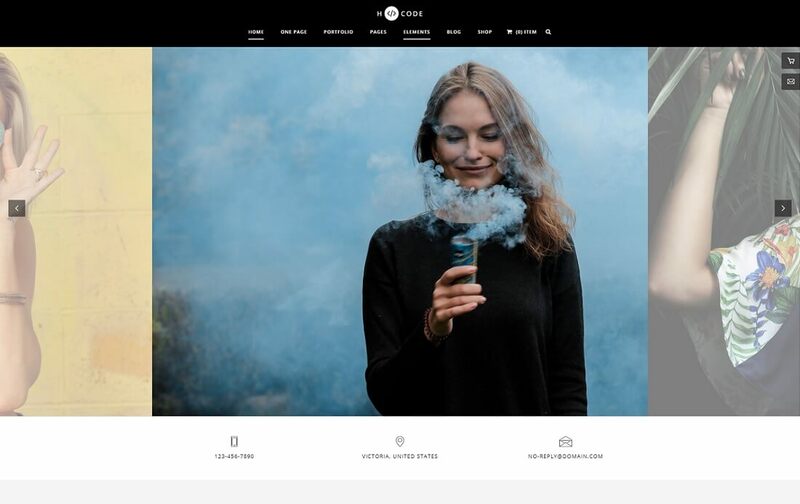 The deal is applied to the entire cart, there is no minimum amount, no maximum usage limit, and it is not limited to a single use per user account. 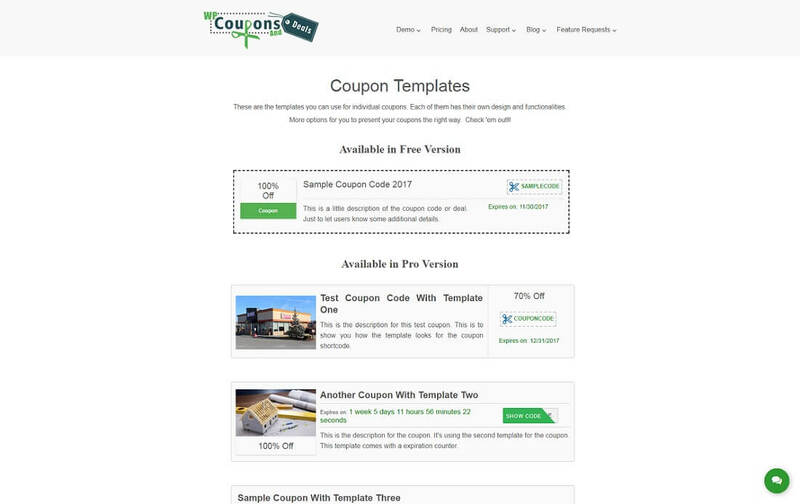 A user can use this coupon multiple times during the sale. 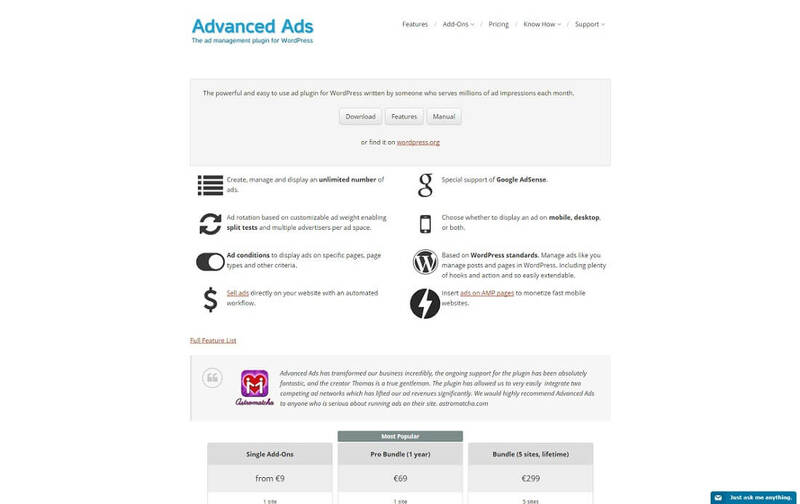 Use the coupon code BFCB2017 at the checkout to get 30% OFF for all Advanced Ads products. 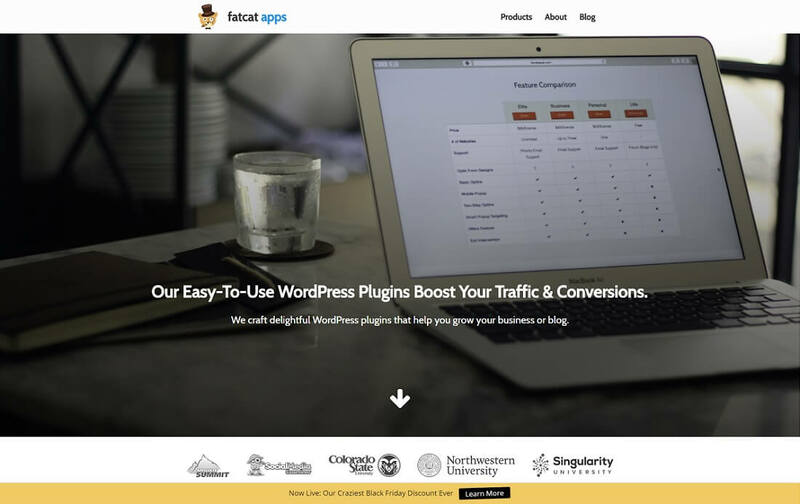 Fatcat Apps offers 30% off all their premium plugins. 30% Off all plugin packs with LIFETIME licenses and support. Use code BLACK30 at checkout for 30% off. Use discount code BFCM2017 to get 30% off any plugin package, upgrade, or renewal. 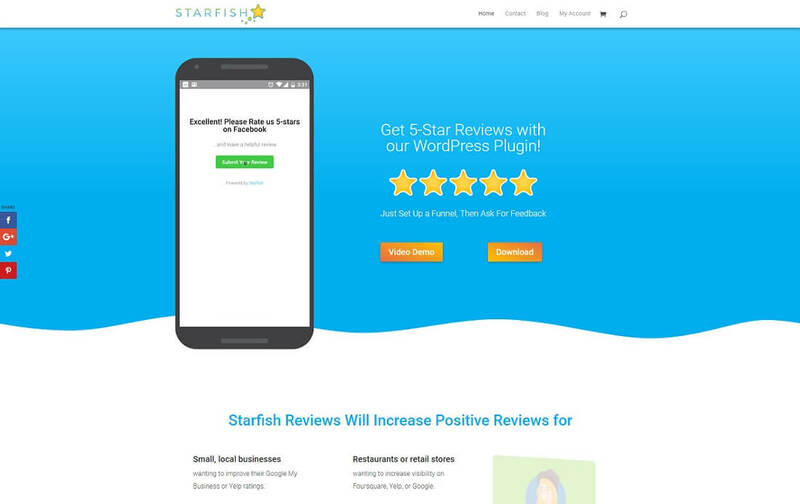 Starfish Reviews offers a lifetime license (which they may never do again) at a huge early adopter price! That is: 60% Off! 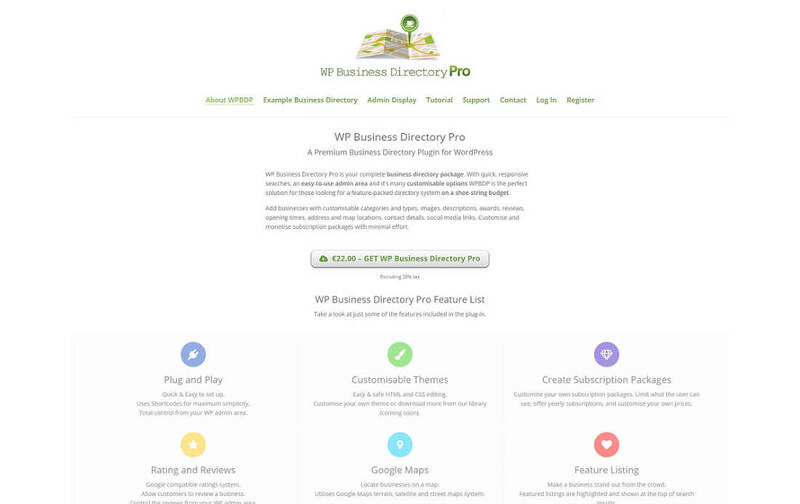 Get 25% off WP Business Directory Pro using the promo code “earlybird2017”. Use discount code BFCM2017 to get 30% off any plugin. 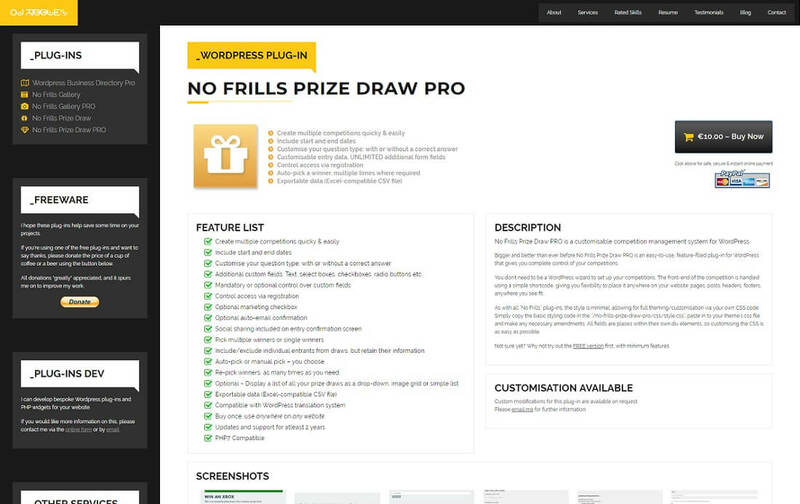 15% off No Frills Prize Draw Pro using promo code “BLACKFRIDAY2017”. With the code BFRCMO2017 you will get 20% off on all the plugins. 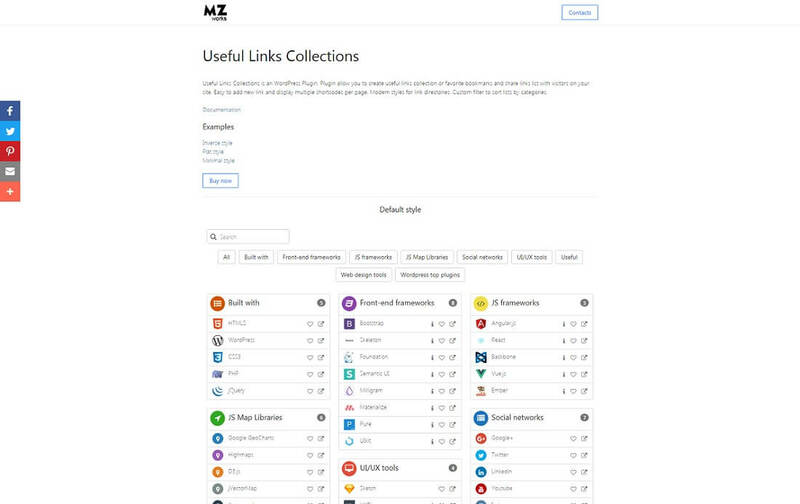 Get 30% off on Useful Links Collections (a premium responsive links directory WordPress plugin) during Black Friday. 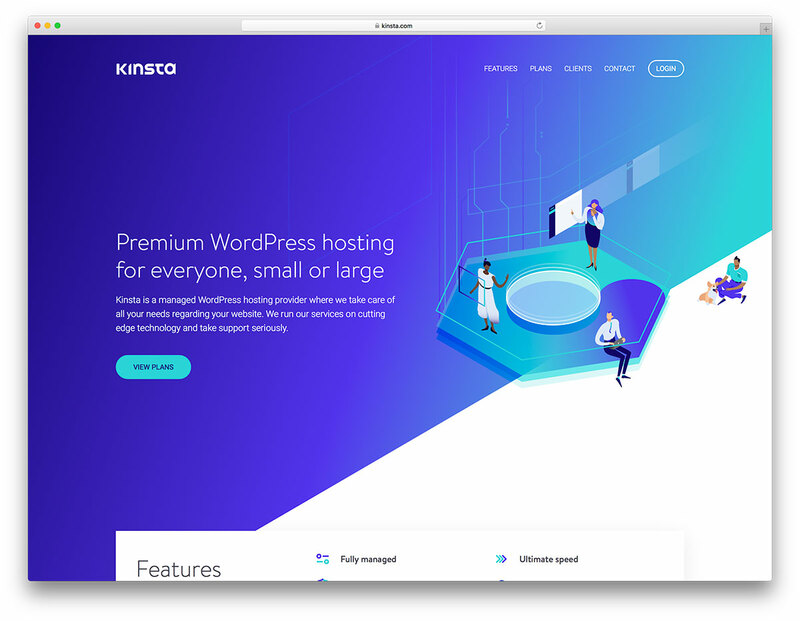 50% Off Memberships: Save on Plus (5 sites) and Unlimited (unlimited sites) Membership including 75+ add ons, support, and updates. Lock in your renewal rate for the life of your membership. Use discount code BFCM2017 at checkout to receive 30% off your purchase. Use discount code BFCM2017 to get 30% off your purchase. 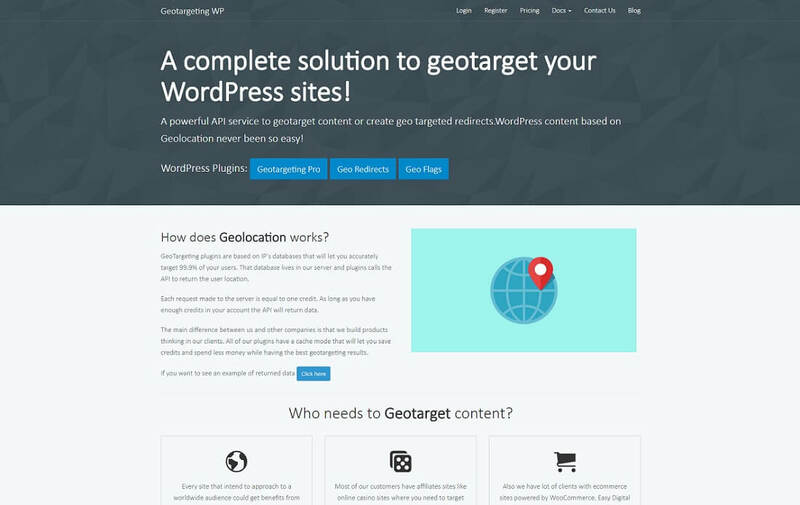 Follow the link to activate the 30% discount on all Google Maps Widget PRO packages. 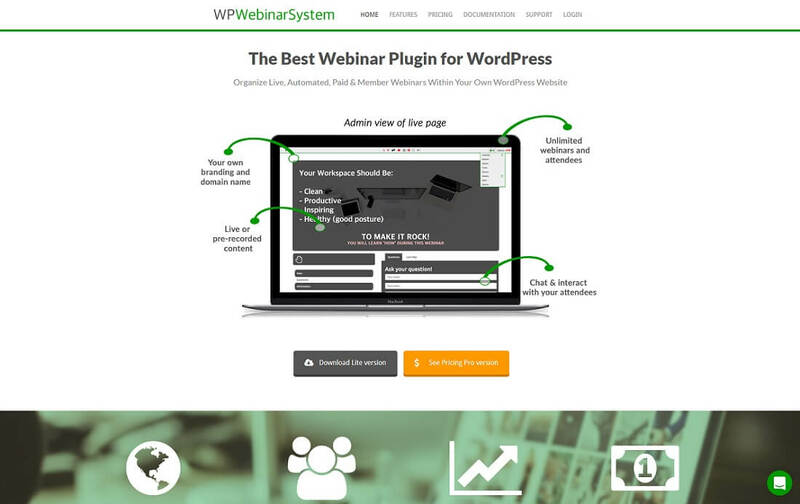 25% off the price of WP Taxi Me Premium by using plugin code BF2017. 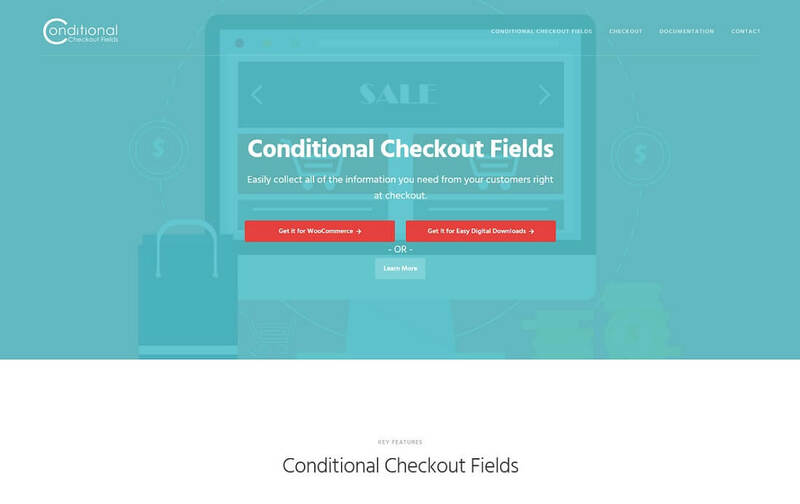 Apply code at checkout. Score yourself a 25% discount on any extension using coupon code BF2017. 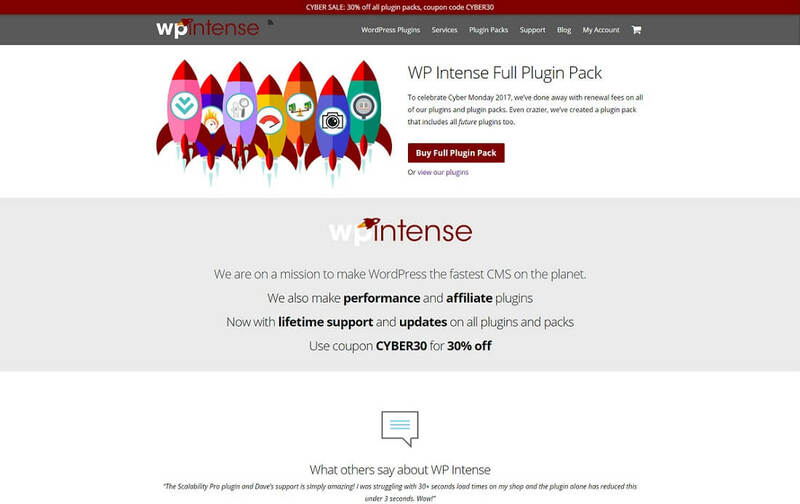 Get 30% Discount on Extended Widget Options plugin, all the add-ons, and renewals. 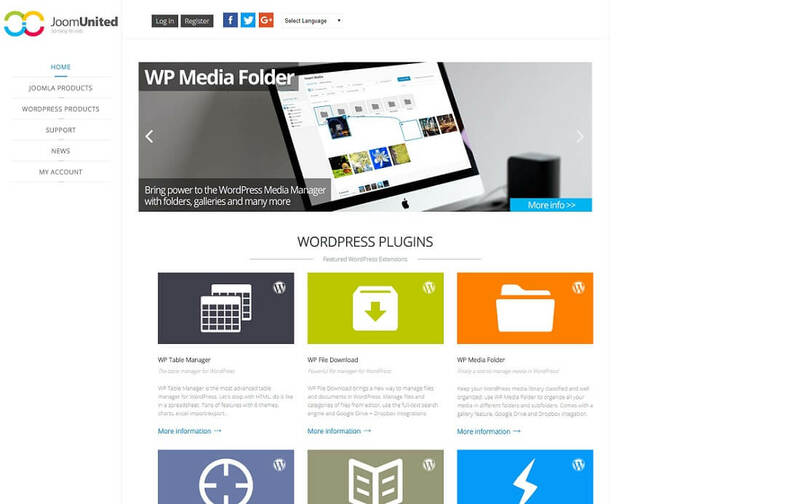 Extended Widget Options is one of the Top-Rated WordPress widget plugins and guaranteed the most complete and user-friendly. Be one of the first to enjoy the latest features at a low price. Just use the coupon code BLACKNCYBER30 at checkout. 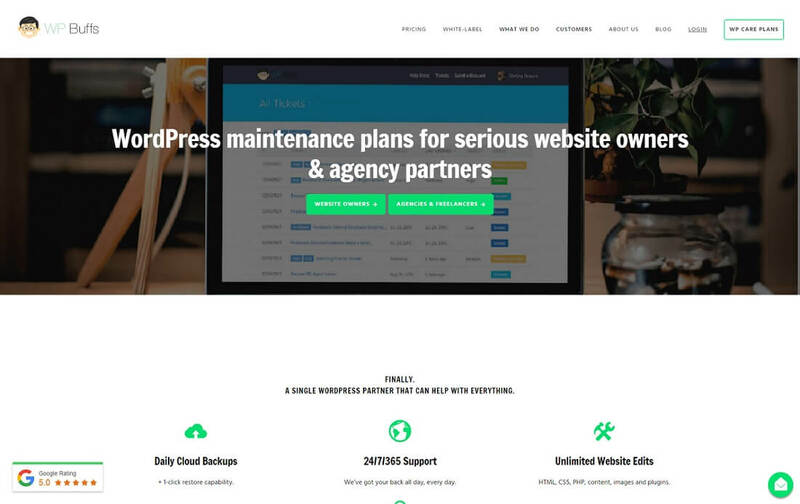 Get 35% off WP Zinc’s WordPress plugins with code BF2017 at checkout. 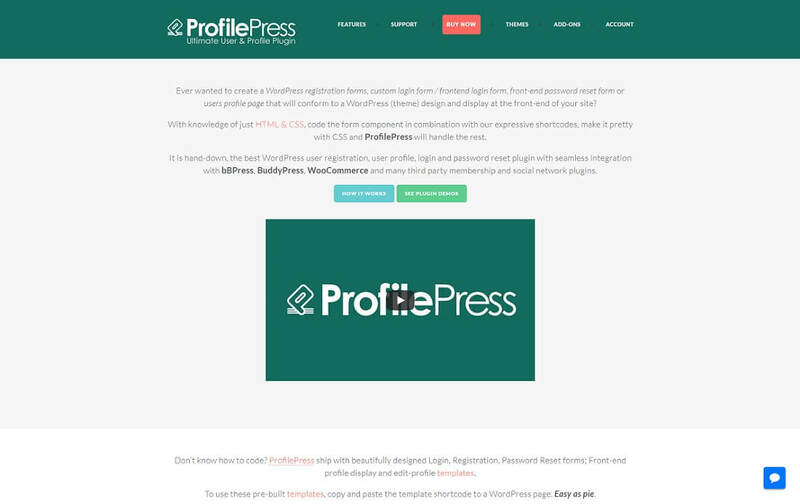 Includes WordPress to Buffer Pro, Page Generator Pro and Comment Rating Field Pro. Follow the link to get 55% off the regular price. 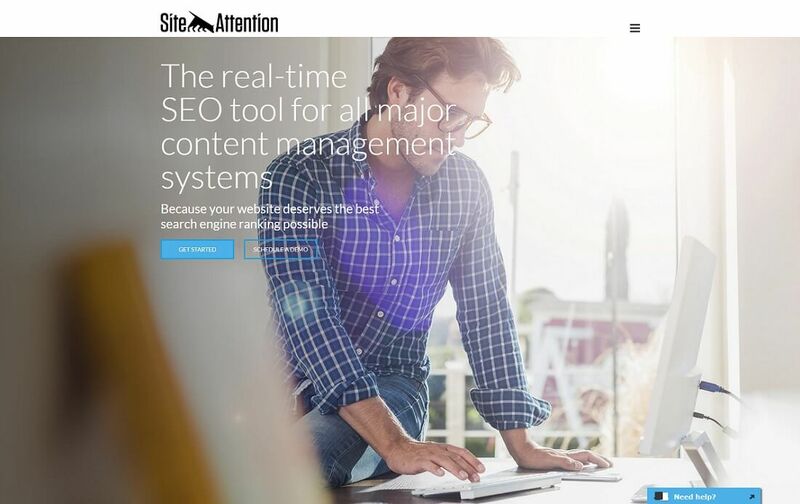 Get 50% off SiteAttention’s real-time SEO tool! Simply insert the code: SABF2017 during checkout. 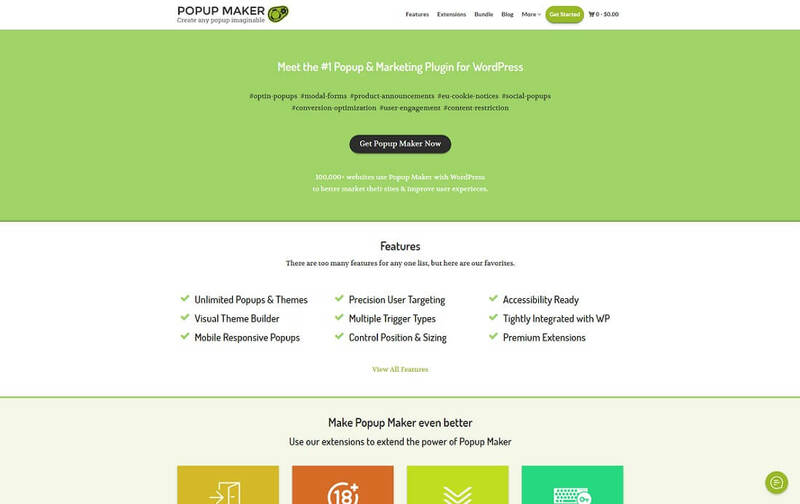 Popup Maker offers 25% off any purchase from Black Friday to Cyber Monday. This includes all extensions or their core extension bundle. Use the code BFCM2017 (auto applied to cart). MalCare is offering the biggest ever sale, a huge 35% off all new purchases (across all plans) and on all plan renewals and upgrades. Looks Awesome Offers 50% Off All Their Best-Selling Premium Plugins. 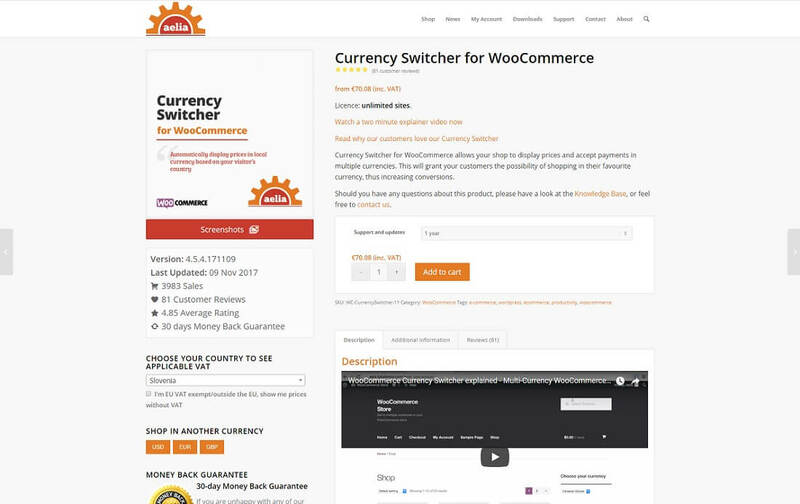 Get 30% off the regular price of the Aelia Currency Switcher and other great plugins for WooCommerce and Easy Digital Downloads. Simply use coupon code BLACKFRIDAY2017 at checkout to get your discount! Get a special 40% OFF on all JoomUnited memberships, including bundles and renewal! Get 40% OFF using the coupon: BFJU. 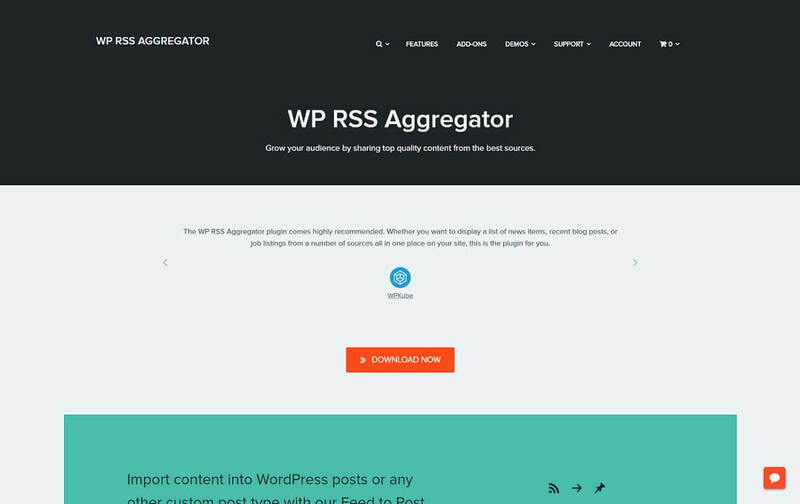 Get 30% off WP RSS Aggregator’s already discounted bundles, or opt for any of the premium add-ons at 20% off. 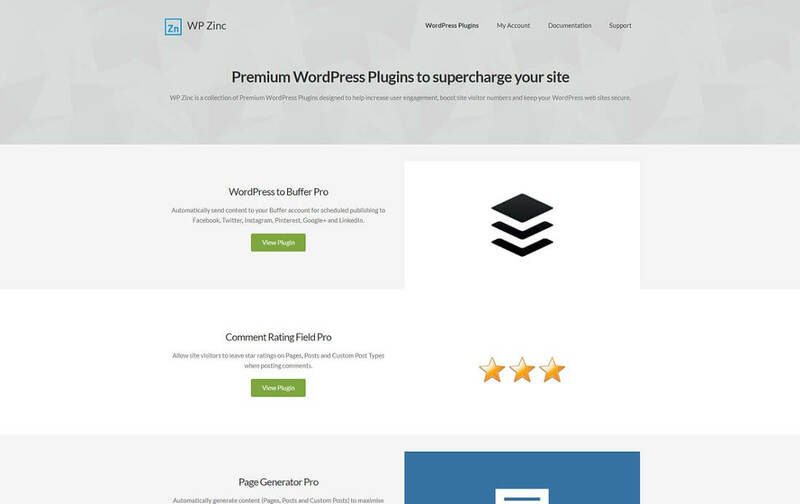 50% off all purchases of premium WordPress plugins for user management and WooCommerce. 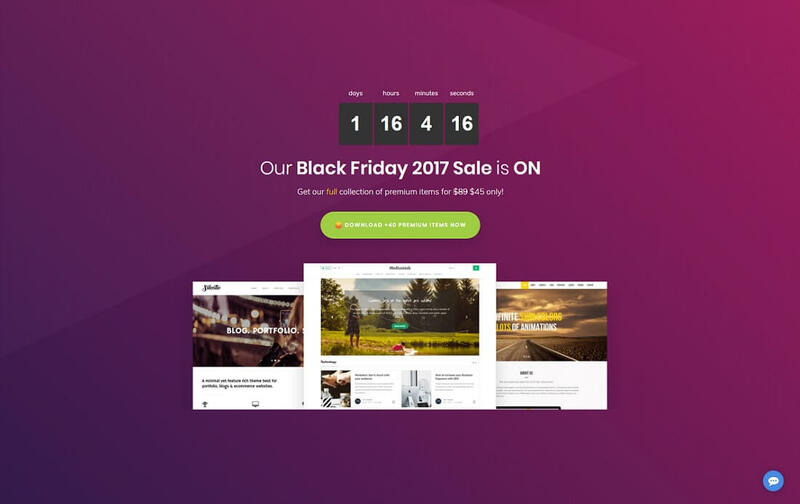 The Ultimate Black Friday Bundle is for WooCommerce store owners who want to run profit-pulling deals & promotions without hassles. You get all the tools you need to run attractive in-store promotions and doorbuster sales. 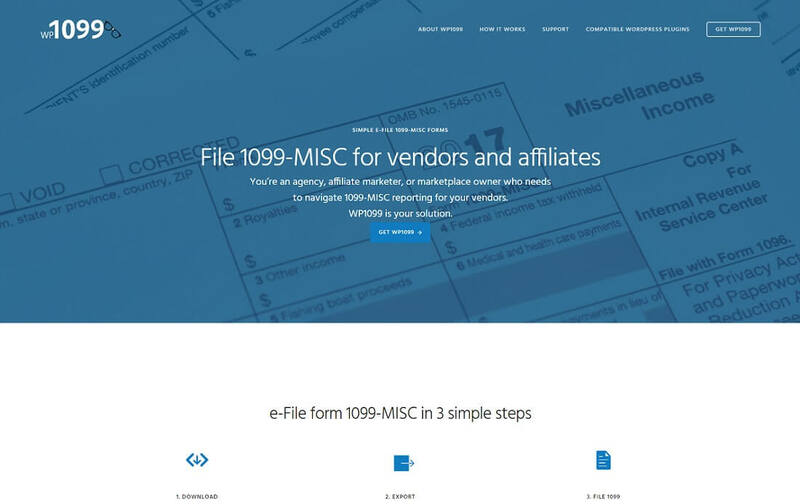 You will receive 30% off on all licenses. The promotion will run from Friday 24th of November until Monday 27th of November 2017, which includes Cyber Monday. 40% OFF all products and memberships using code BF2017 at checkout! 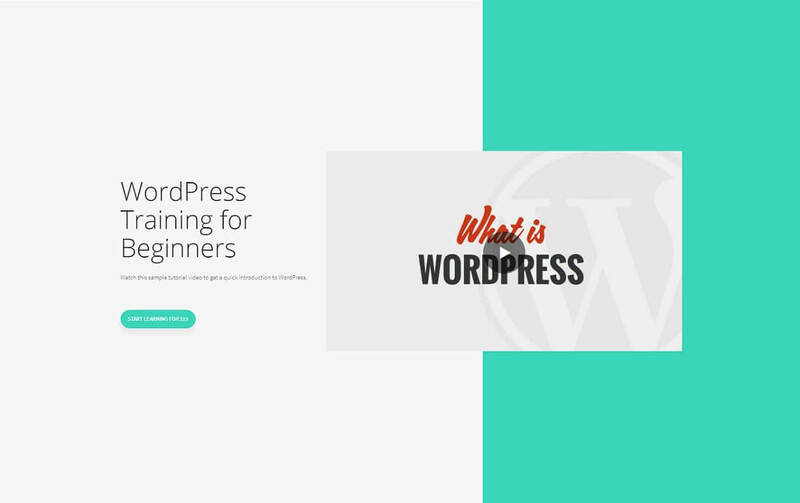 Get 117 Training videos to help understand the basics of WordPress, Woocommerce, WordPress SEO, basic theme customization and more! All this at a whopping 75% Off of the already low price. 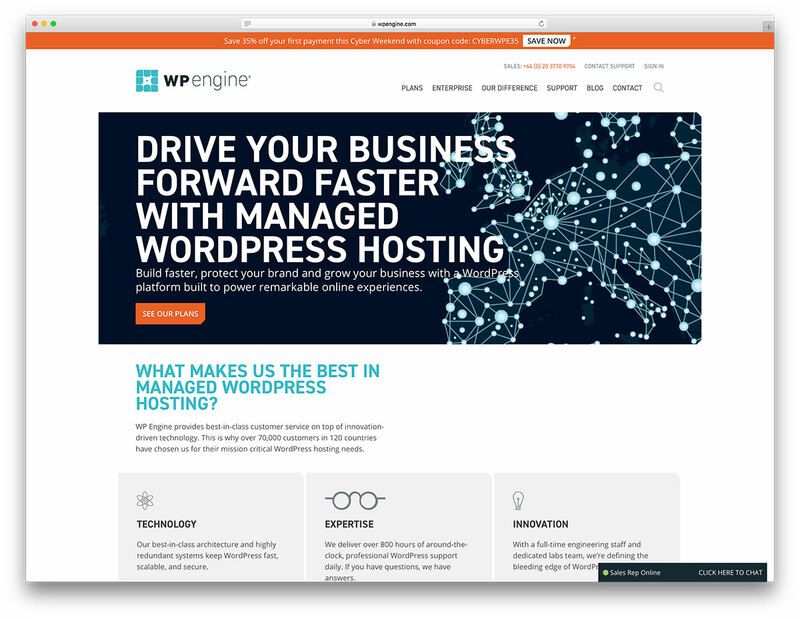 Save 70% OFF all WordPress Hosting plans for six months. Use promo code SAVE70 at checkout. Follow the link below to activate yourself the 30% discount on all packages. 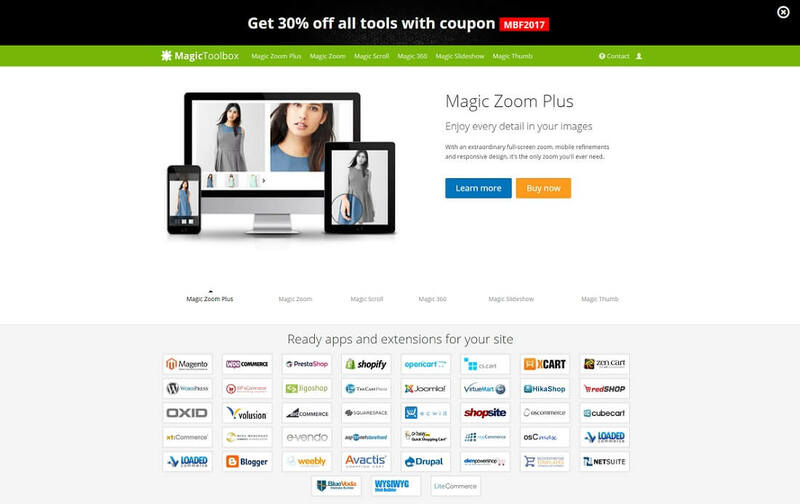 40% off plugins and themes at Imagely using the coupon code, BF40. 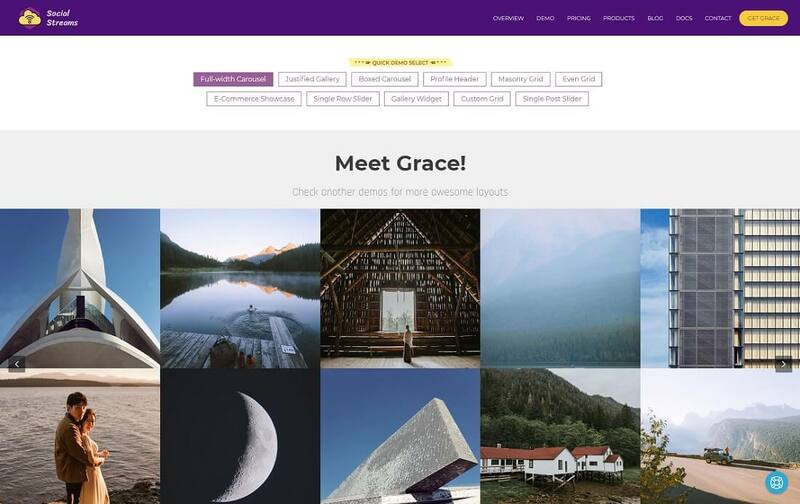 Join 1.3 million people creating beautiful image galleries with NextGEN Gallery, the most popular gallery system ever for WordPress. Add stunning display styles, social sharing, print sales, digital downloads, proofing galleries, and more with NextGEN Plus and NextGEN Pro. 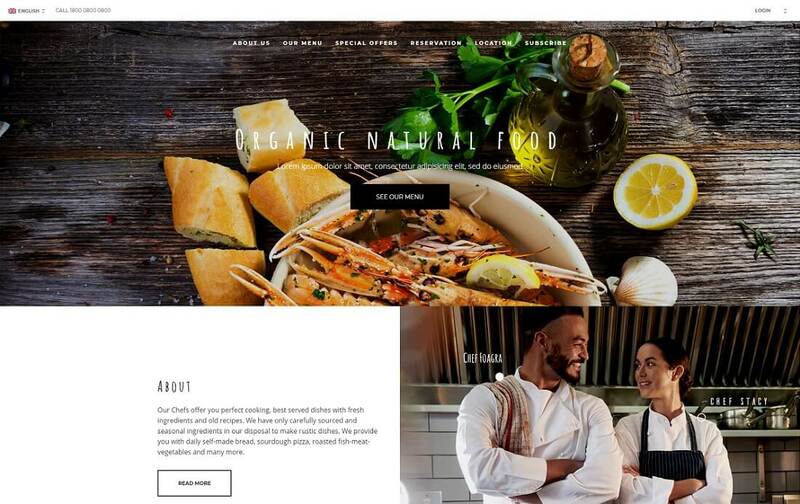 Plus, get finely tuned and pixel perfect website design with our Genesis child themes for photographers. 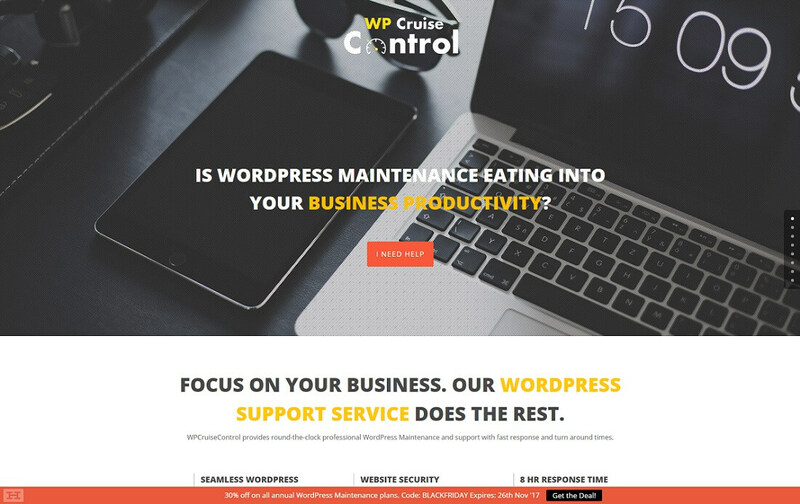 WPCruiseControl Offers 30% off on all annual WordPress maintenance plans. WP Buffs offers 40% off all their annual care plans! Buy WPShout’s 2 courses together for just $197 (reg $444). 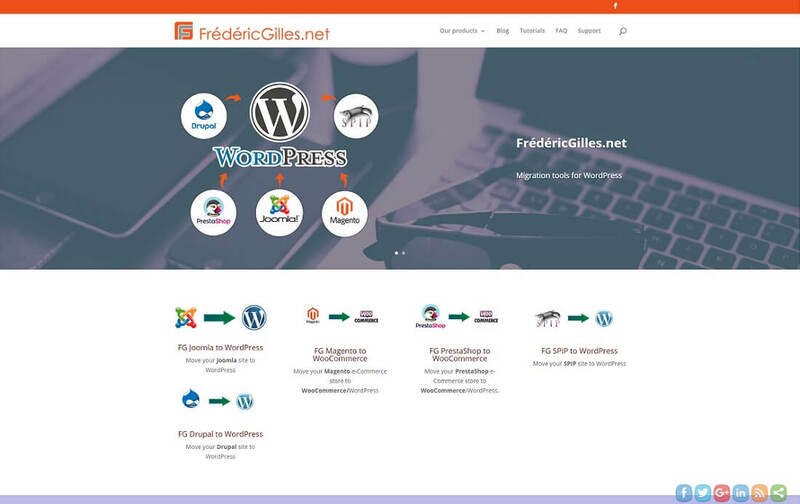 Up and Running (Deluxe): learn WordPress development course. 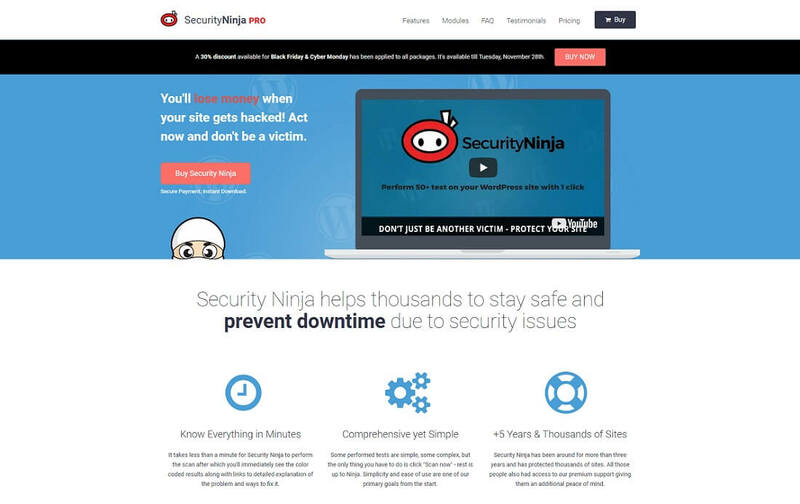 And WordPress Security with Confidence (Site-Owner). Use code FRIDAY at checkout. 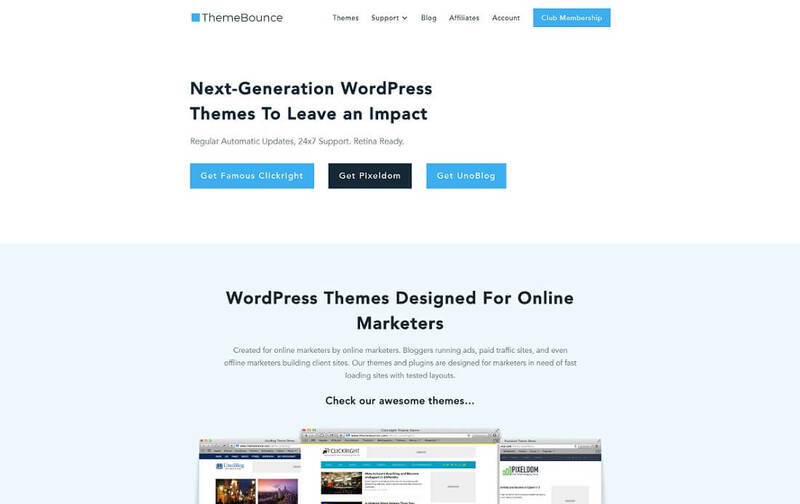 Beautiful WordPress themes, plugins and Elementor landing pages without the confusing parts. Get 40% off all purchases (including lifetime plan!). 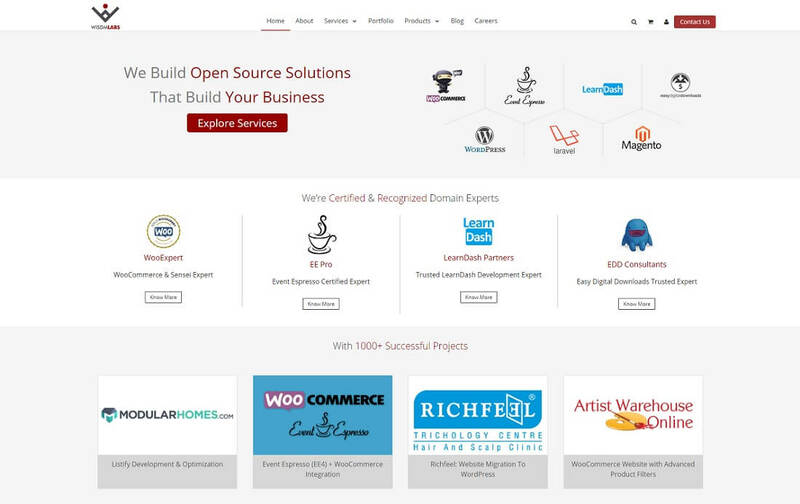 Solwin Infotech offers 50% off all their WordPress products. By using coupon code BLACKFRIDAY-35, you will get 35% Off any purchase! 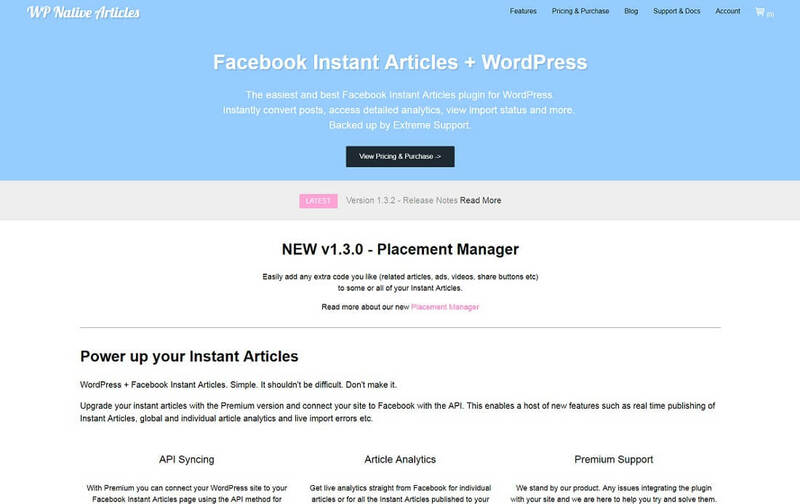 Popups Premium, Facebook Login Pro and much more! 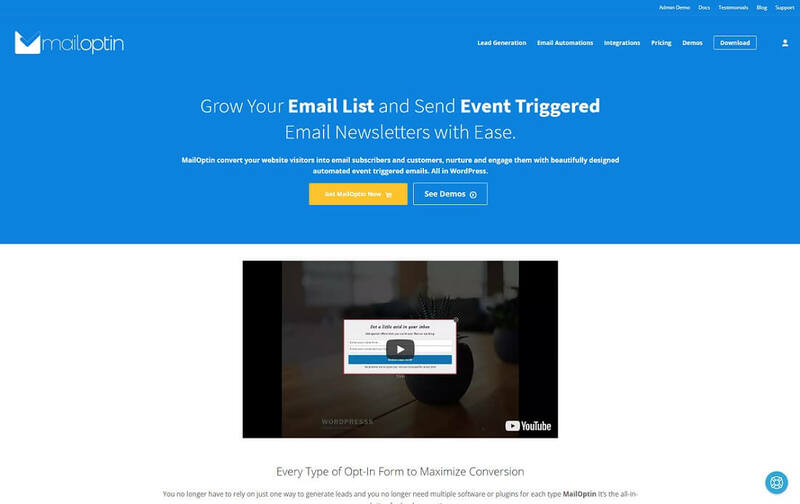 Convert Pro is an all-in-one advanced lead generation plugin. It comes with an intuitive drag and drop editor, giving you complete design freedom to build beautiful call-to-actions in minutes. 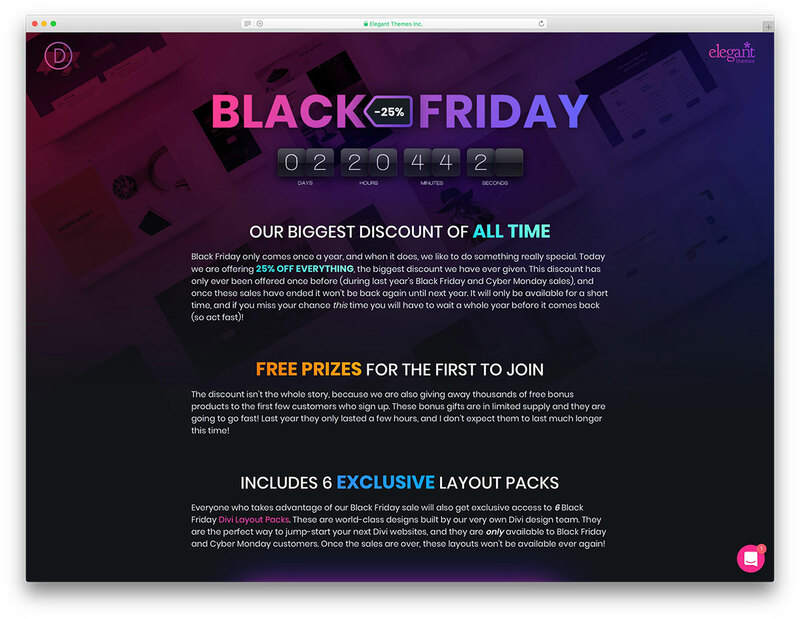 Convert Pro is offering 30% OFF on all licenses during this Black Friday sale! Use coupon code BLACKFRIDAY at the time of checkout. 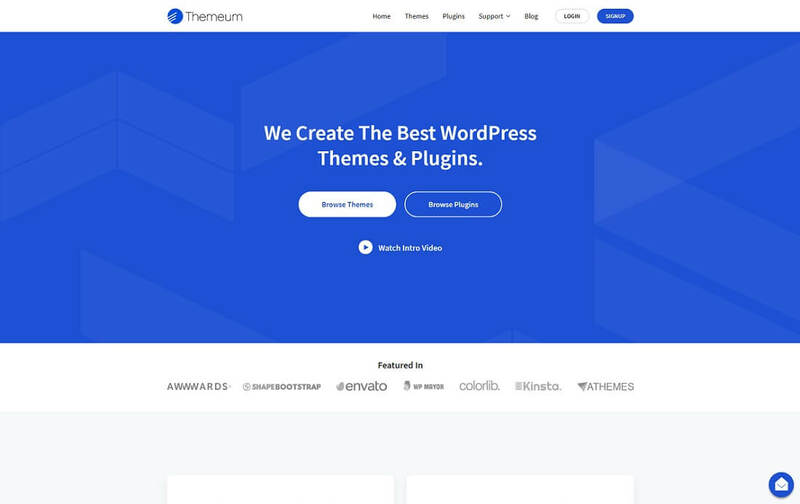 On the occasion of 2017 Black Friday, Themeum is offering 50% off on all WordPress themes and plugins. Use the coupon code BLACKFRIDAY50. 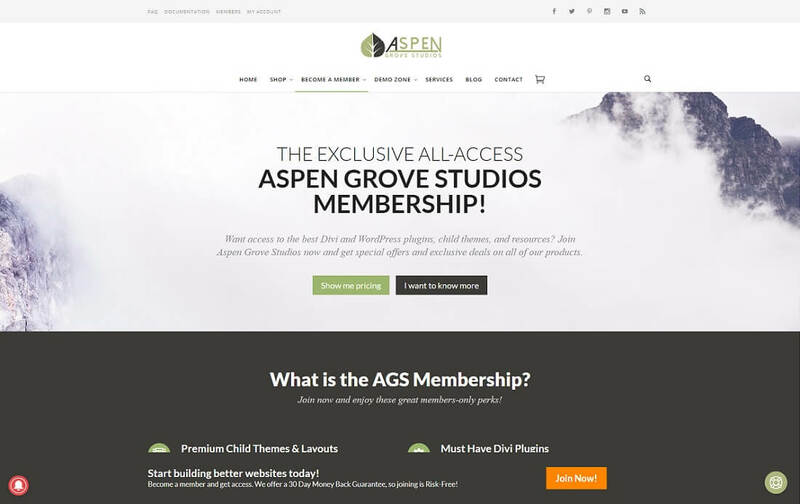 For this year’s Black Friday and Cyber Monday season, Aspen Grove Studios will be discounting their Lifetime Memberships from $297.00 to a whopping $249.00. 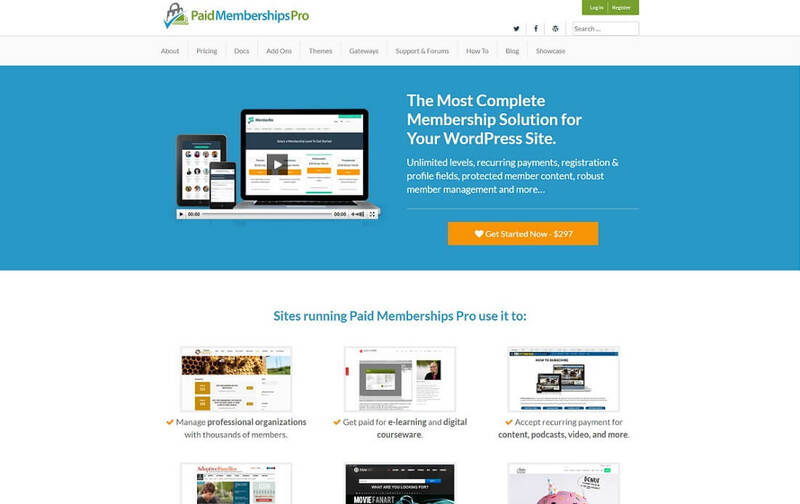 The Lifetime Membership grants access to all existing and future WordPress, Divi and Extra products developed. There will also be a 25% discount applied for a la carte purchases of all plugins and themes. BlogVault is offering the biggest ever deal. 35% off all new purchases (across all plans) and on all plan renewals and upgrades. Foliovision is offering 1/3 off of their FV Player Pro license. During the Black Friday Weekend, you can buy your license for $50 instead of the usual $75! Black Friday + Cyber Monday Sale! 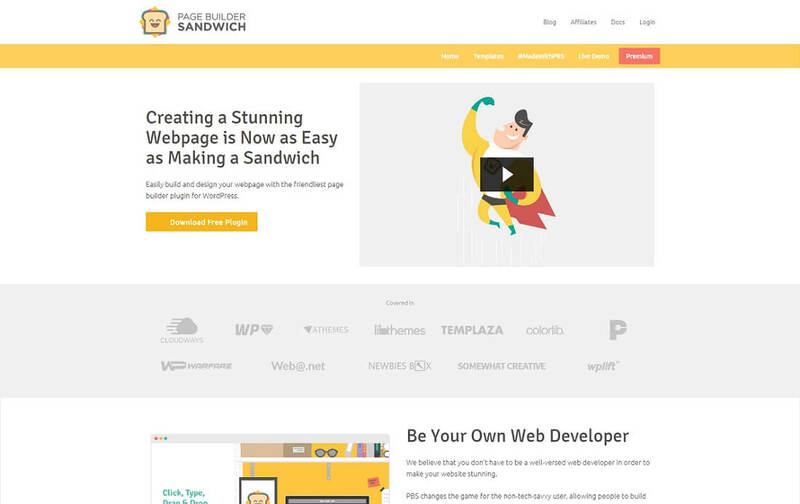 33% off on any Page Builder Sandwich license – single, unlimited, yearly, and lifetime – from November 20-27. CSS Hero up to 60% off. Nextend is excited to offer a huge 60% discount on all their plans! 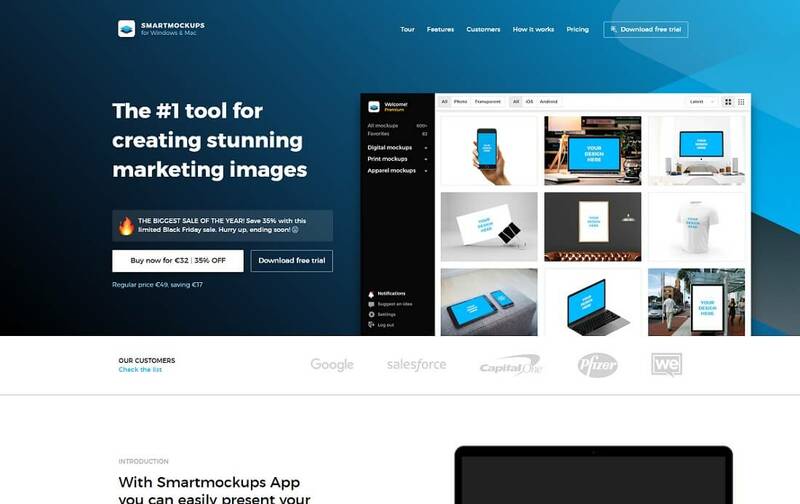 Head over to Smart Slider 3 and enter code BF2017 at checkout! 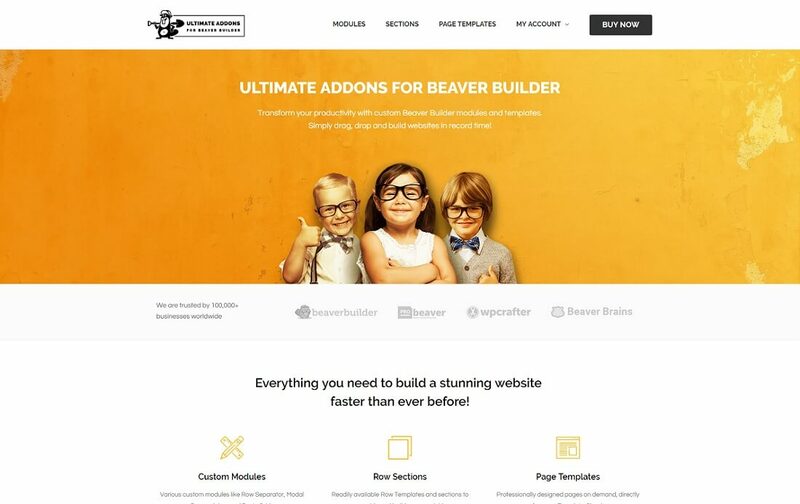 The Ultimate Addons for Beaver Builder offers a 30% OFF on all licenses during this Black Friday sale! 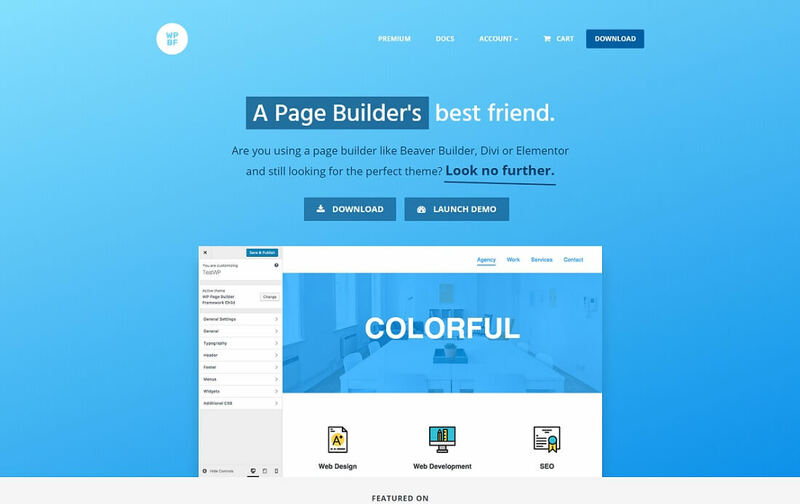 These Beaver Builder add-ons come with 45+ custom modules and 300+ page and section templates that help you create beautiful websites in minutes. Use coupon code BLACKFRIDAY at the time of checkout. Black Friday Deal on MasterBundles – 50% OFF. Use code BlackFriday2017. 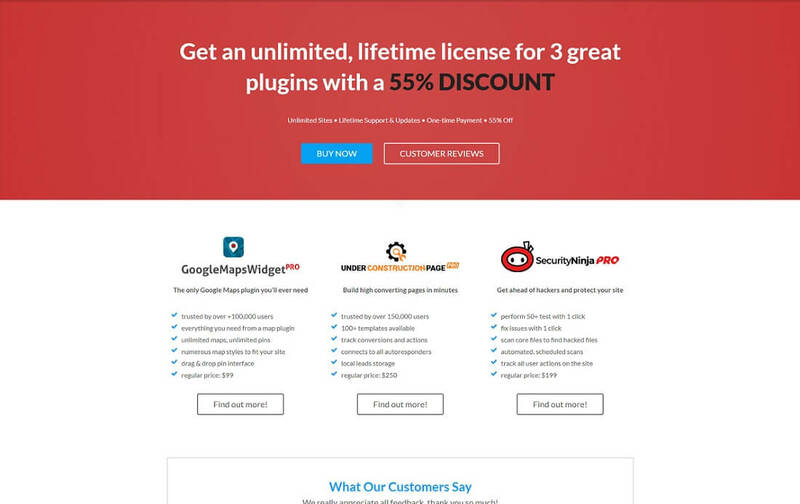 50% off all plugins, themes & live-chat support. The deal will be up from Nov 22nd to Nov 29th and new customers can save 35% (note: after this deal the price will go up to $69). Up to 150% bonuses on credits purchases. No coupon code required. 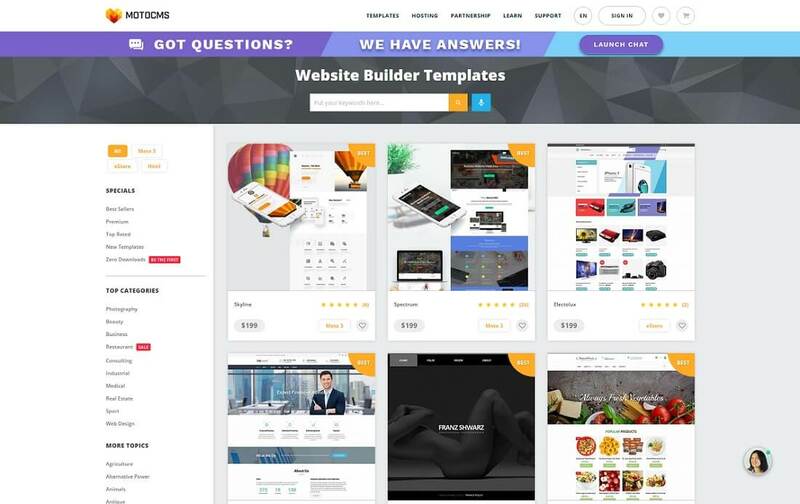 Get a 30% discount on Page Builder Framework Premium Addon. Follow the link to get 30% off any UCP package. 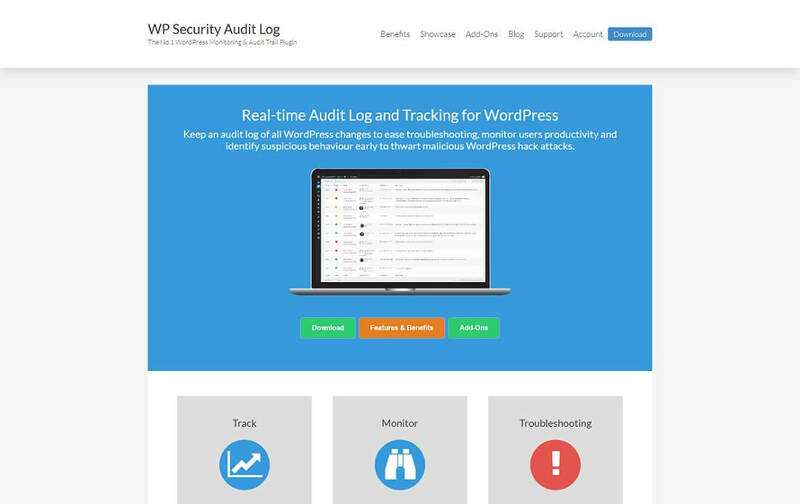 Get 30% off on the WP Security Audit Log premium add-ons. Just use the coupon code BLACKCYBER2017 during checkout. 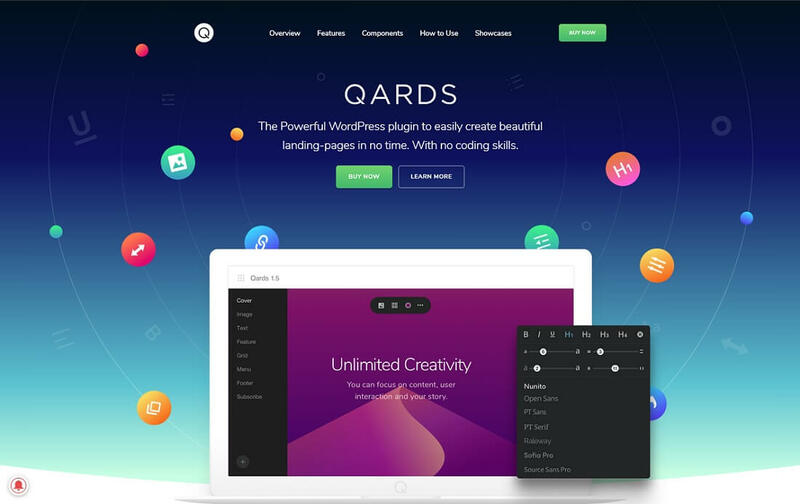 Designmodo offers a discount coupon code: BLACK, which gives you a 70% off on all their products, including Qards plugin. 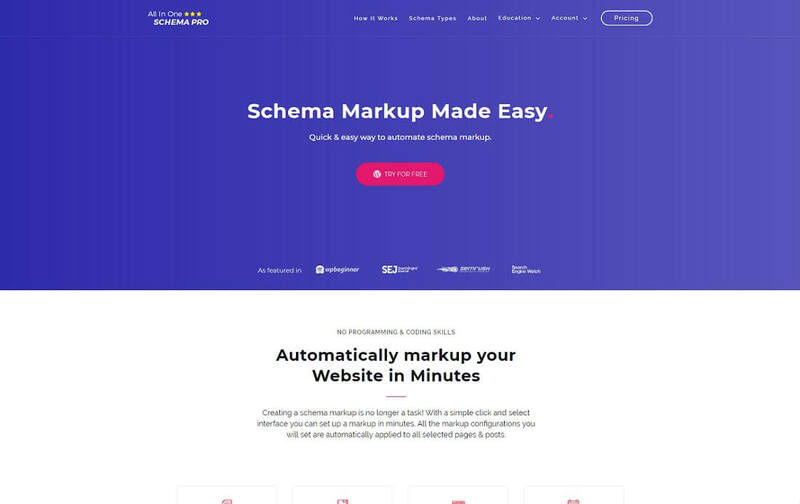 Schema markup of hundreds & thousands of pages in minutes. All-in-one Schema Pro allows you to set 13 types of schemas, including the recipe, book, article, job posting, reviews and a lot more. 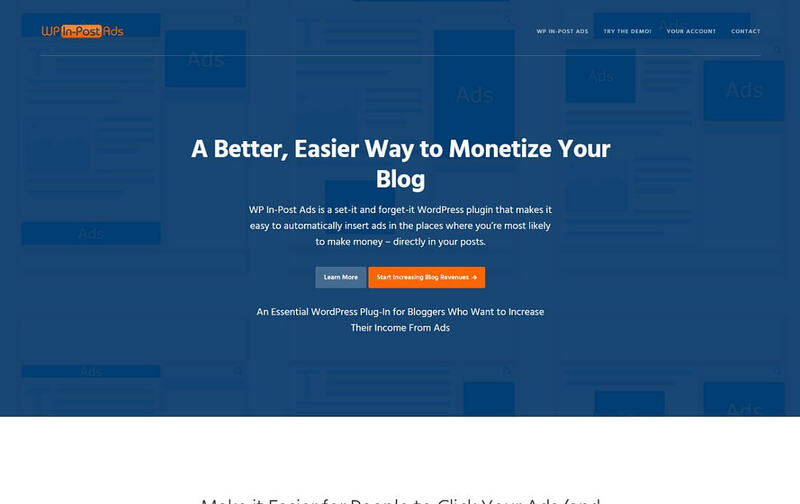 Automatically markup your Website in Minutes. You can purchase the Schema Pro plugin at 30% OFF by using the coupon code BLACKFRIDAY at the time of checkout. Use coupon code BLACKFRIDAY50 during checkout to purchase any GetSiteControl plan half priced. Just sent you an email about our plugins. 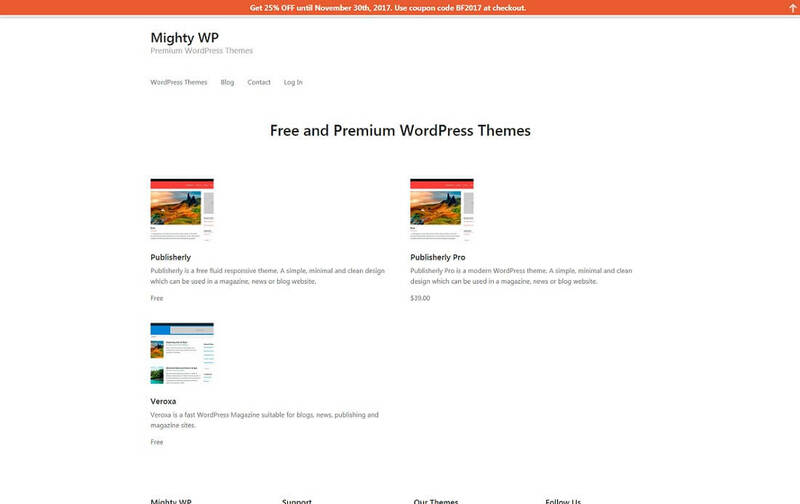 Would love to participate in the Black Friday Sale with our premium WordPress plugins. Thank you for information. I have received all necessary information from you and next week we will update this post to include your offer as well as several others. Sent you all the necessary information about our Black Friday / Cyber monday deal on 10th Nov 2015 via your contact form. Please do let me know if you have not received it. I would love to be the part of your Black Friday / Cyber Monday Deal RoundUp. I did receive your message. Will add your offer on this list as well. I have sent an email to you through the contact form with all the basic info you need for the Black Friday Deal. Do let me know if you haven’t received it or need anything else. Thank you for sending details! Your deal is now listed on article above. I have just sent you an email mentioning all the details of our offer for Black Friday Deals. 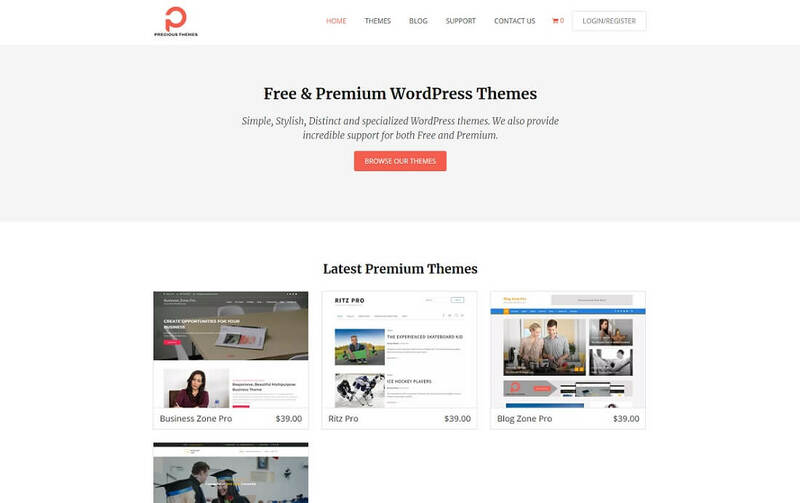 Would love to participate in the Black Friday Sale with our premium WordPress Themes. We are offering 30% off on all our plugins at emdplugins.com for Black Friday and Cyber Monday. Valid from Nov 25th till 1st Dec 2015.
thanks so much for featuring our FV Player Pro deal in your article! 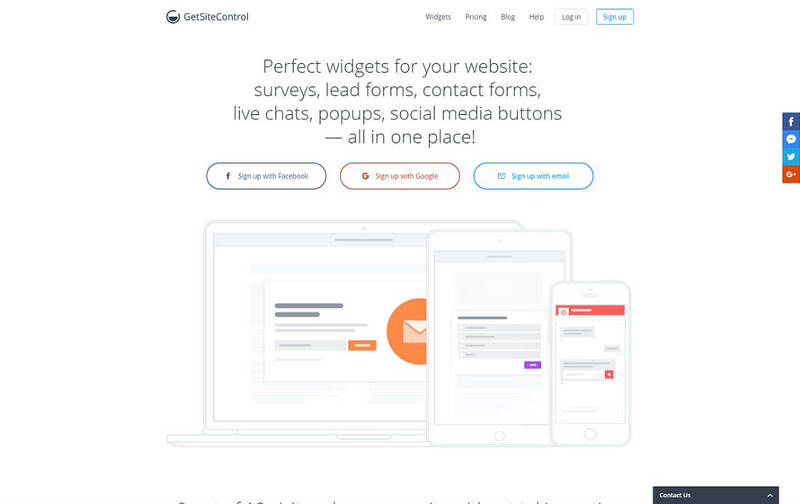 Thanks for adding our site to the list.